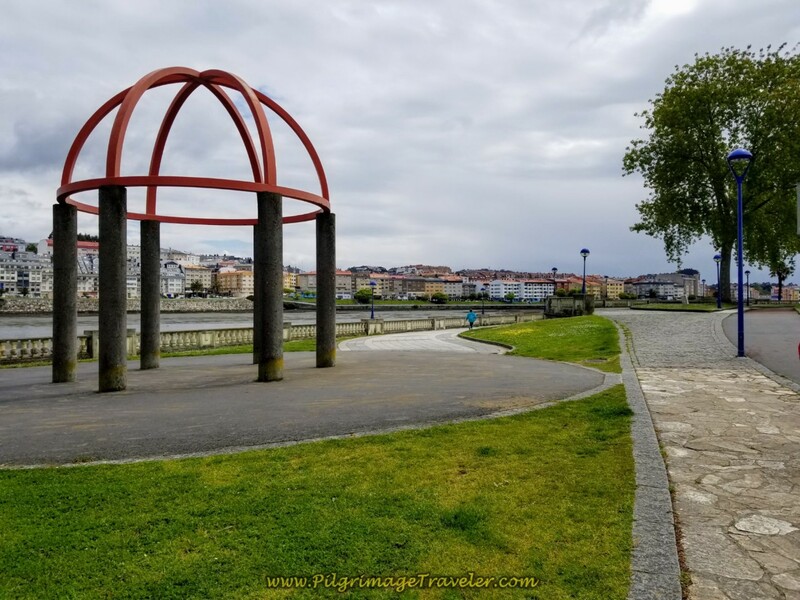 Our day one on the Camino Inglés, of the La Coruña Arm was a long jaunt through urban areas, a riverside park and country roads, with lofty views and a very long, very steep climb at the end of the day. 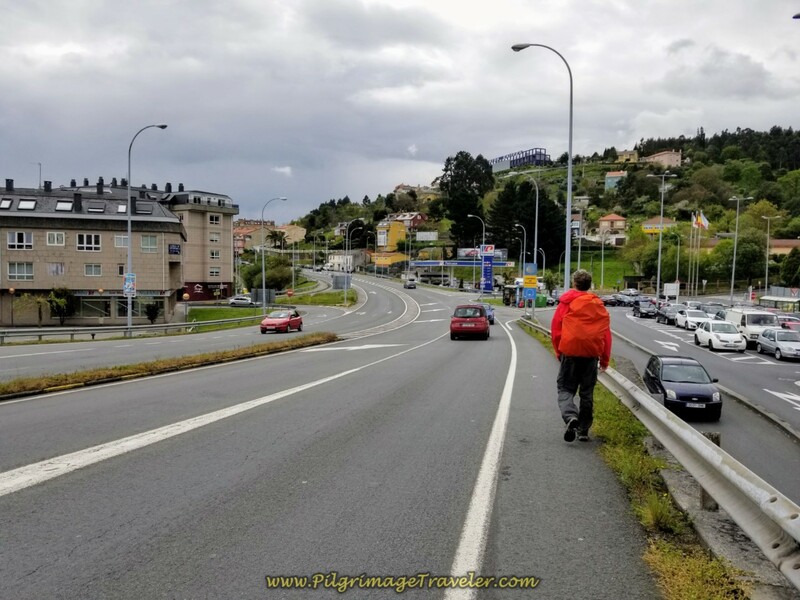 While a strong and fit walker could do the entire La Coruña Arm to Hospital de Bruma in one day, for a total of 33.63 kilometers, we chose to do it in two. 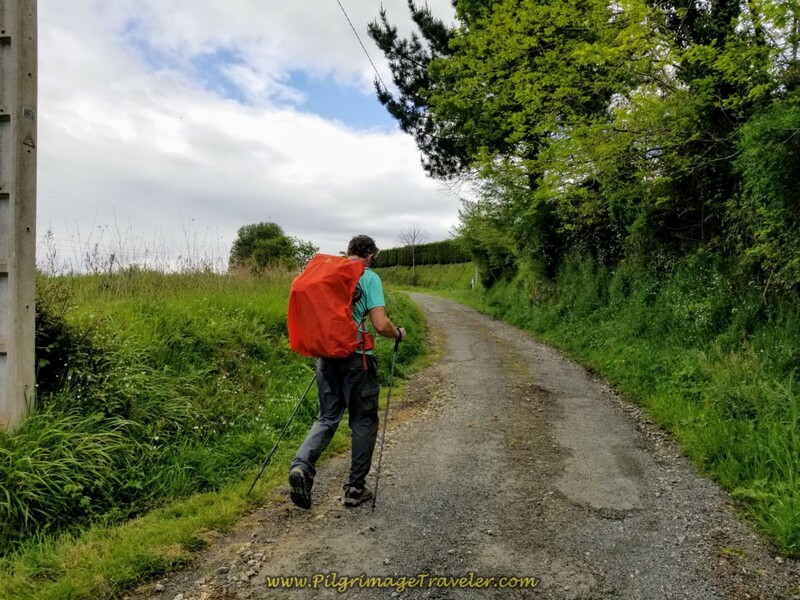 This is a wonderful day for those who are completing their Celtic Camino from Ireland, having documented in their credentials, the 25-30 kilometers before arriving in La Coruña. 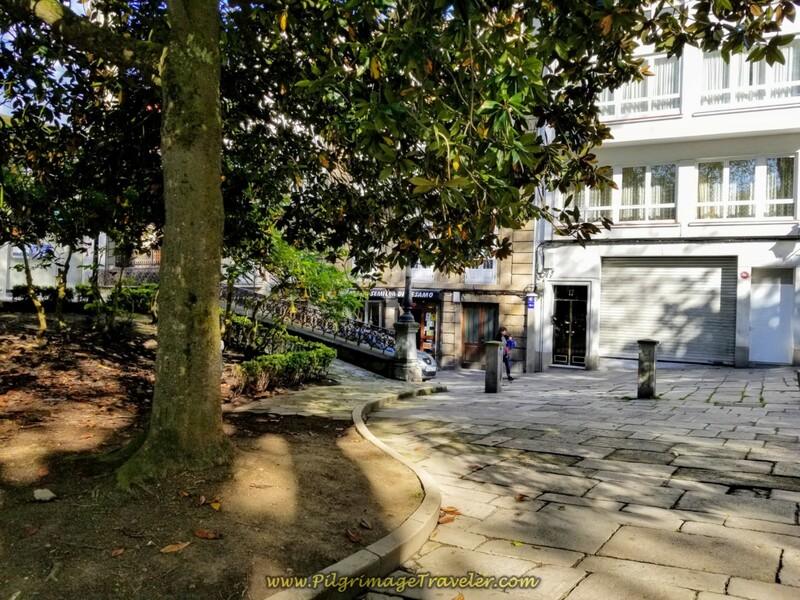 I hope you spend some time exploring the city of A Coruña, the name of this town in Gallego, the Galician Dialect. Gallego is a mixture of Spanish and Portuguese. Please click on the link to see what this gorgeous seaside town has to offer! Here is our Google map of this day, uploaded from our GPS tracks. 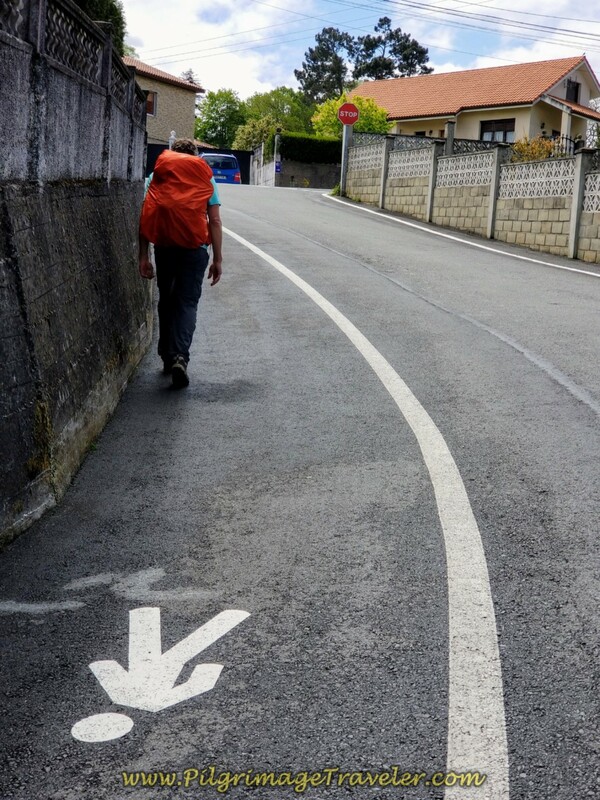 We found the Way to be mostly easy to find except in a few rough areas in the city of La Coruña itself. 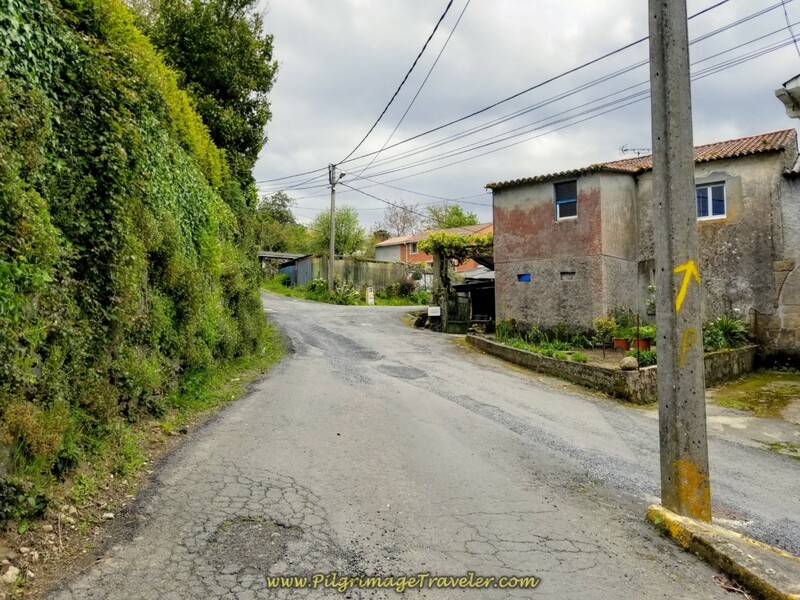 You must look closely, for the blue Camino signs, (notice them in the photos below), looking up for them, more than down. 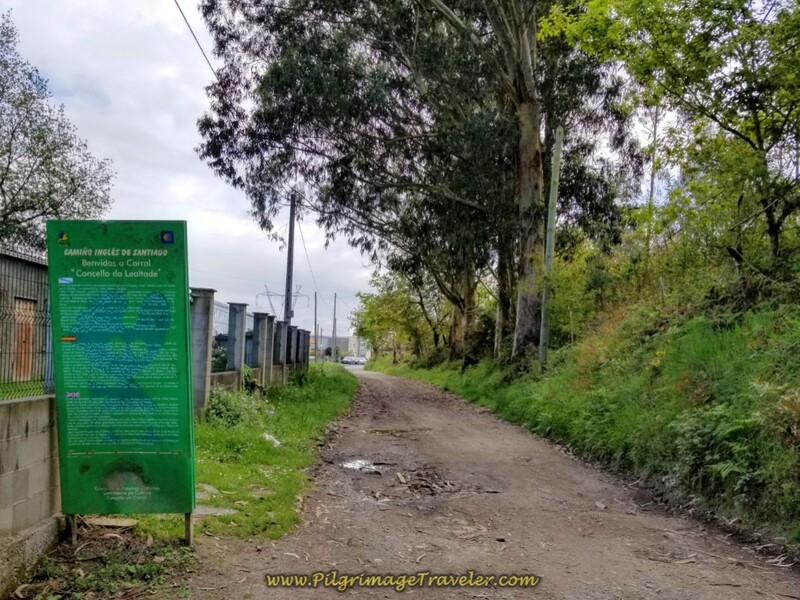 These signs are new-looking, since the Camino Inglés has been rerouted, but they are farther spaced than on other Caminos. There are essentially no blue Camino signs unless there is a direction change, so you have to stay alert at all times. It may help you to study the route the night before. This entire day is almost entirely on pavement, except for a few short segments. Once out of the city, the pavement isn't all that bad, because you are walking on very quiet and rural roads. 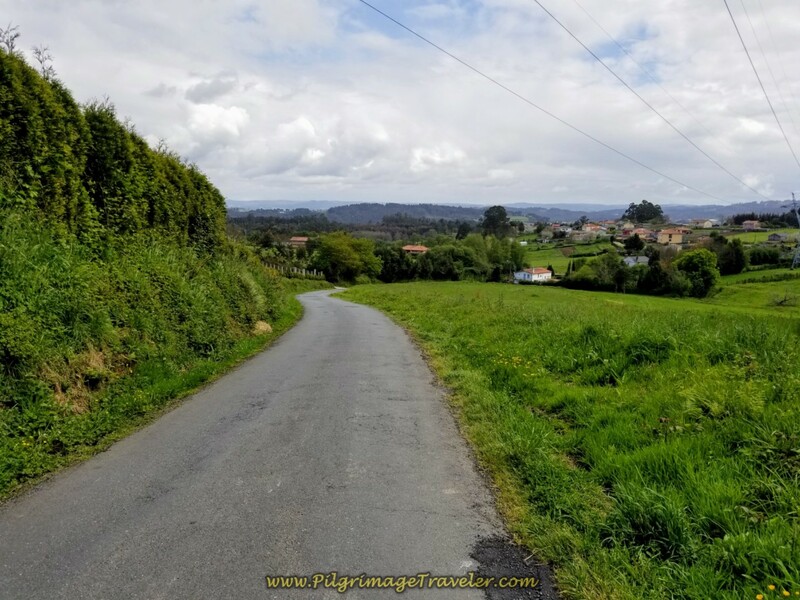 I have added accommodations, cafés and supermarkets to assist your Camino. 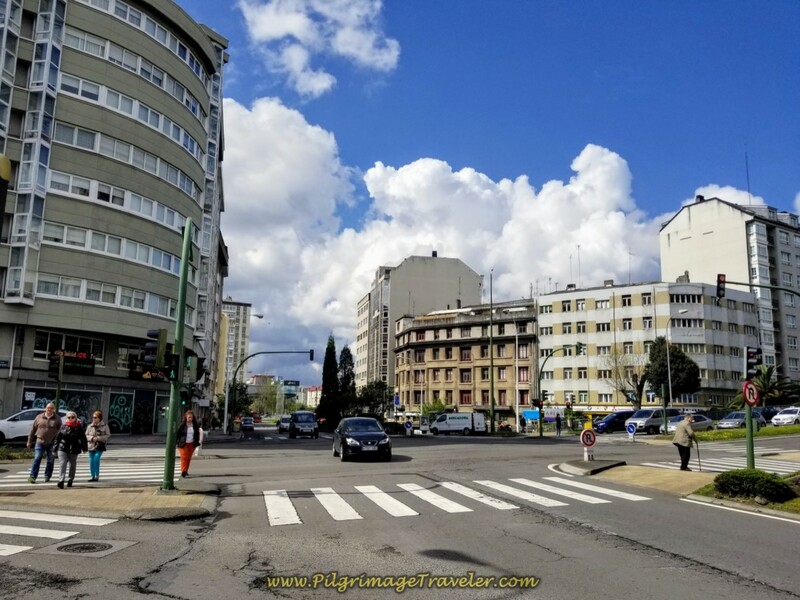 There are so many cafés coming out of La Coruña that I only added the one where we stopped, several kilometers into the day on the outskirts of the city. Then when you leave the city, they are much fewer and far between, so I placed them on the map for your convenience. Do not be fooled by the brevity of this day one! It is not easy. Since I had to turn off my GPS after wandering around and getting lost, the elevation profile is in two segments for this day. My apologies! 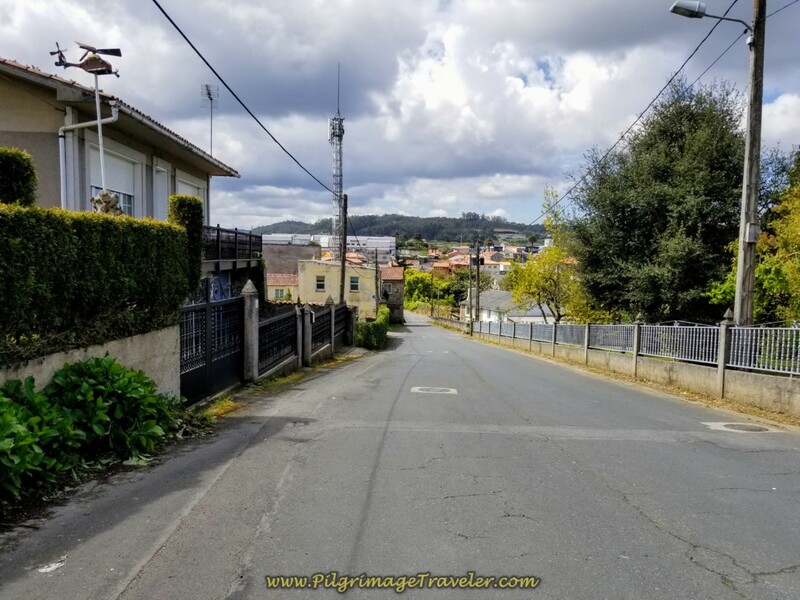 You can see in the first profile below, that the church, at the start, is on a small hill, but there is very little elevation change in the first four kilometers walking through the city of La Coruña. Then the fun begins! It is uphill and down, ending the day in a long, serious 5.0 kilometer steep climb that seems to never end. The total accumulated elevation gain is 478 meters (1500 feet), nothing to take lightly. 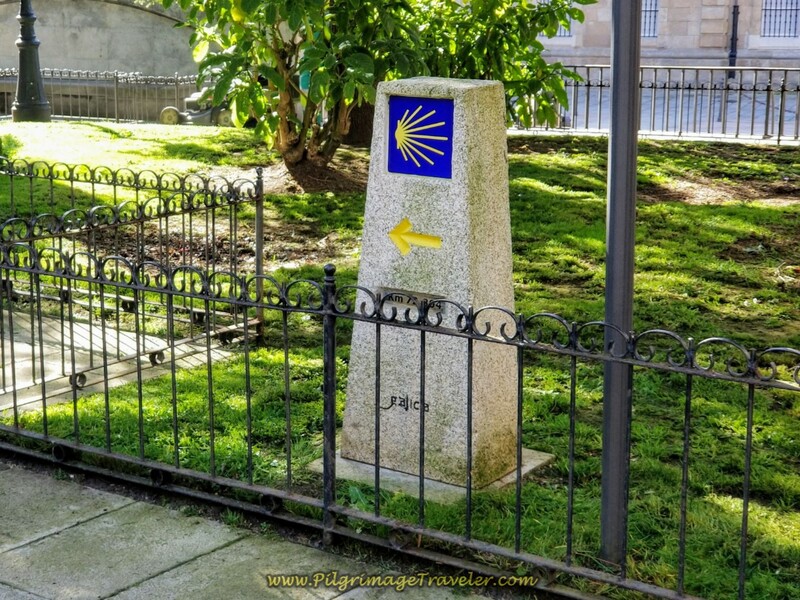 The official start of the Camino Inglés is at the Igrexa de Santiago in the old medieval part of the town within the center of the T-shaped peninsula. 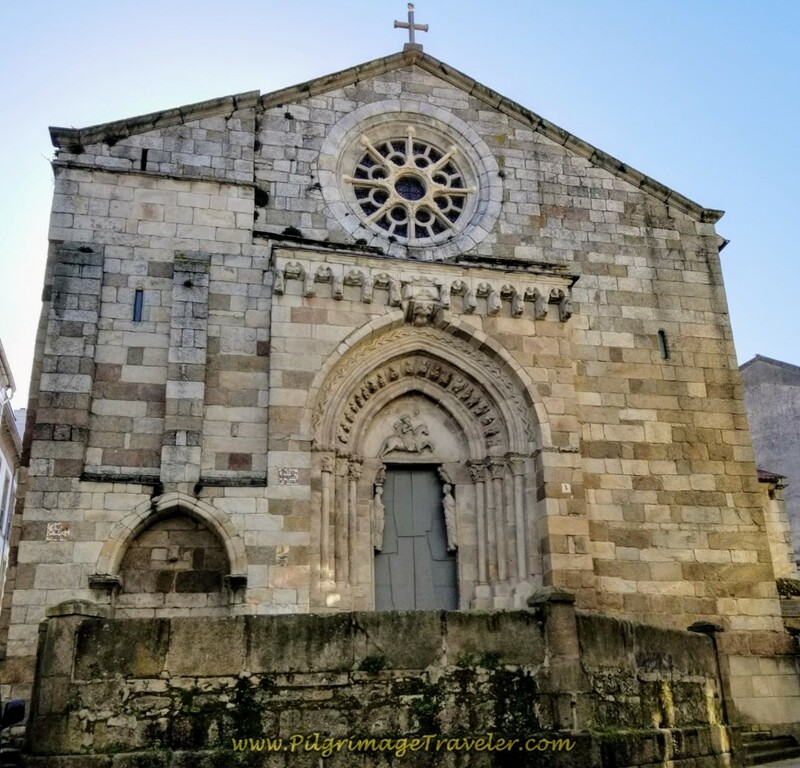 It is a lovely old church in the Romanesque style, built in the 12th century. 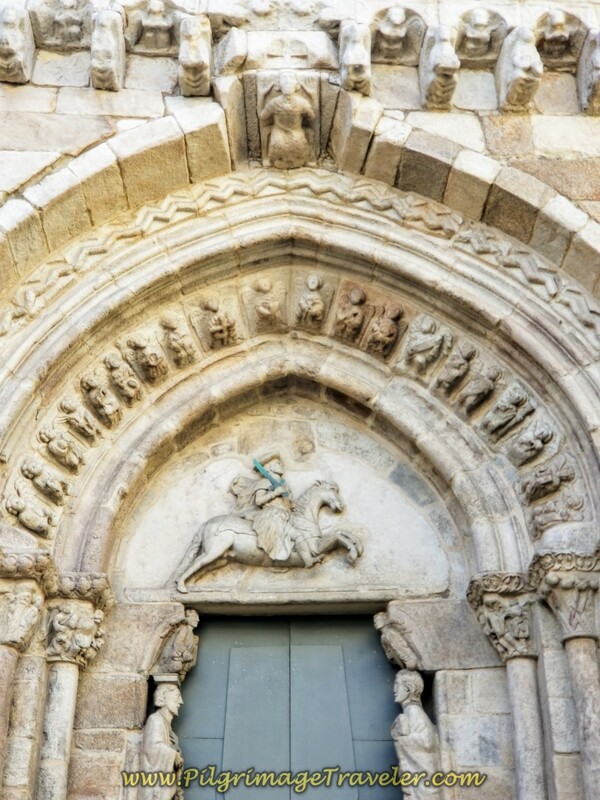 The portal, below right is Gothic, with a depiction of St. James as an equestrian, the Santiago Matamoros, or St. James, the Moor Slayer. Alas, the church was not open on the morning of our arrival, but I have read that the inside is quite lovely, with many more depictions of Santiago. 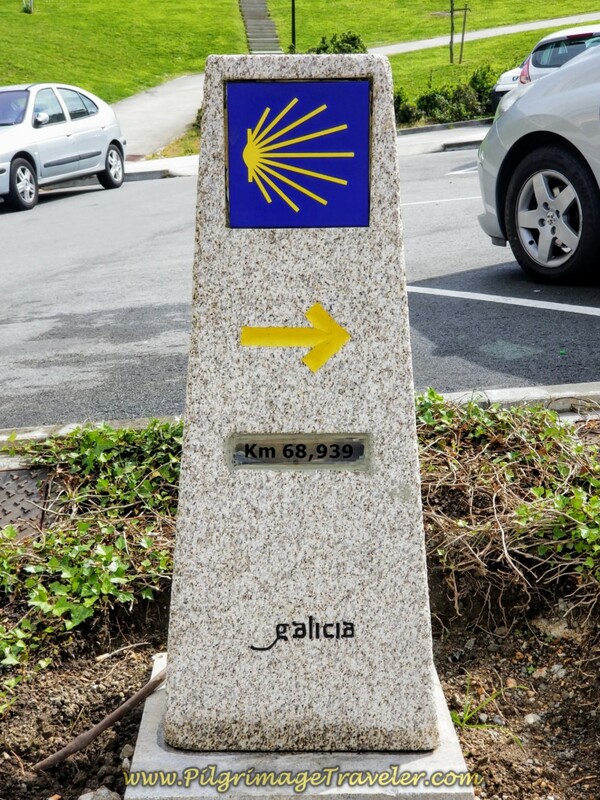 The Camino goes around to the left side of the church on the Rúa Santiago where the first official kilometer marker can be seen, just behind it. Here is a photo of it, at 72.884. 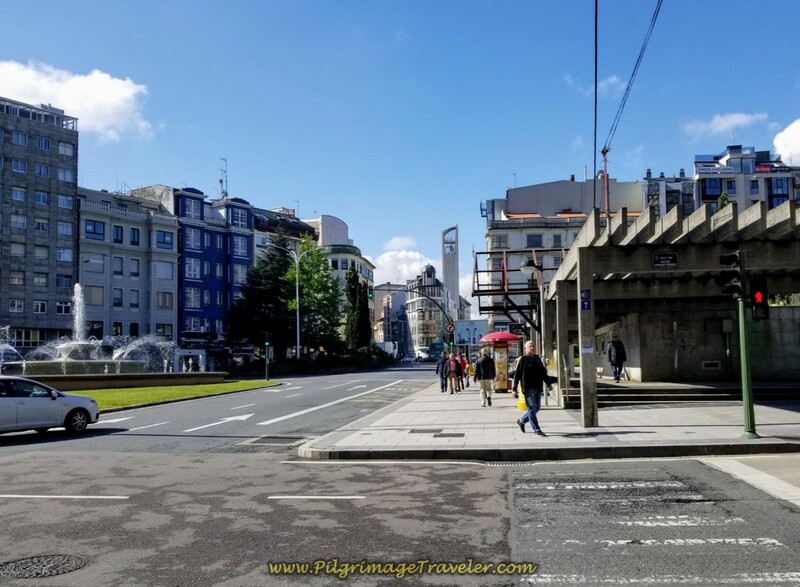 The "official" length of the Camino Inglés as endorsed by the cathedral in Santiago de Compostela is 75 kilometers, so I found this one to be of interest. 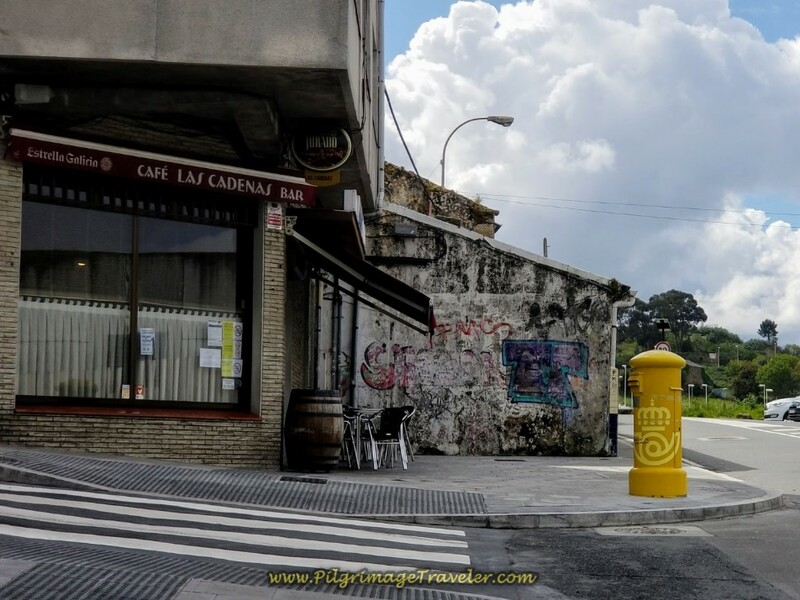 After admiring the back of the Church to St. James, continue on the Rúa Santiago and look for the first blue Camino sign, with the yellow directional arrow on the wall of the building shown in the photo below. Turn left here onto the small pedestrian street shown. 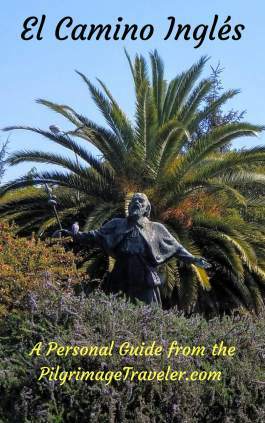 Walk through a small plaza with a statue, the Fuente de Deseo in the center. This plaza is called the Praza do Xeneral Azcárraga and was named after a famous general. The plaza in the old city was a center for commerce in the late 1800's most notably for the sale of flour. It is a very inviting and shady place lined with banana and ash trees. 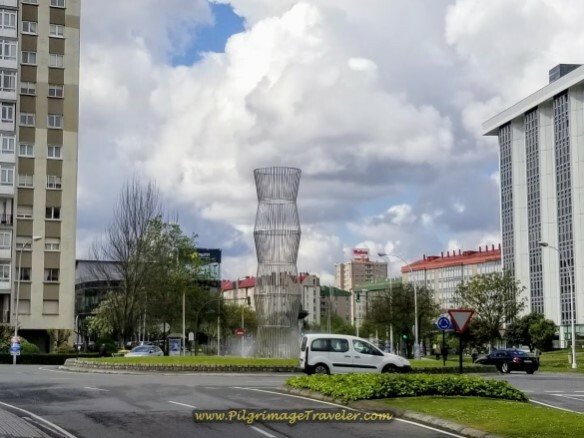 After walking through the plaza, turn left onto the Rúa Dama, shown below. 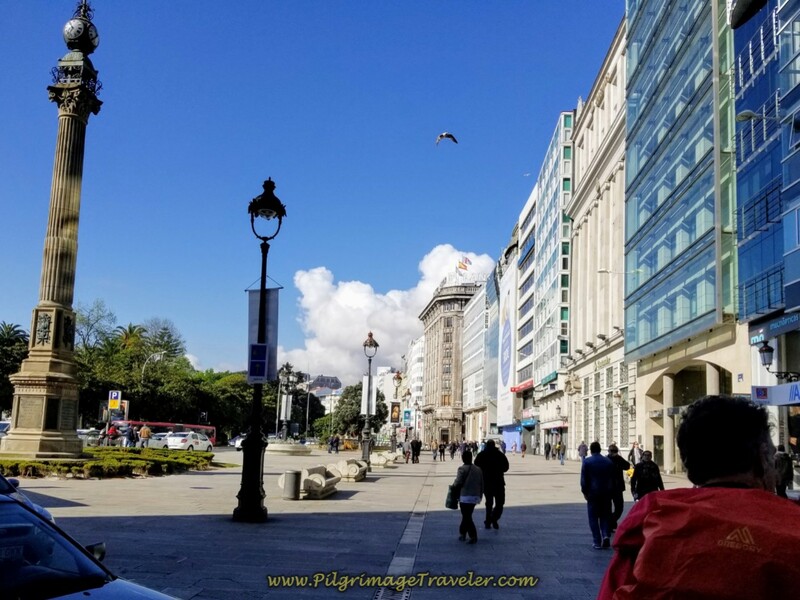 The next move is a right turn onto the Calle Ángeles at the Plaza Ángeles, shown below, heading toward the archway leading into the María Pita plaza. 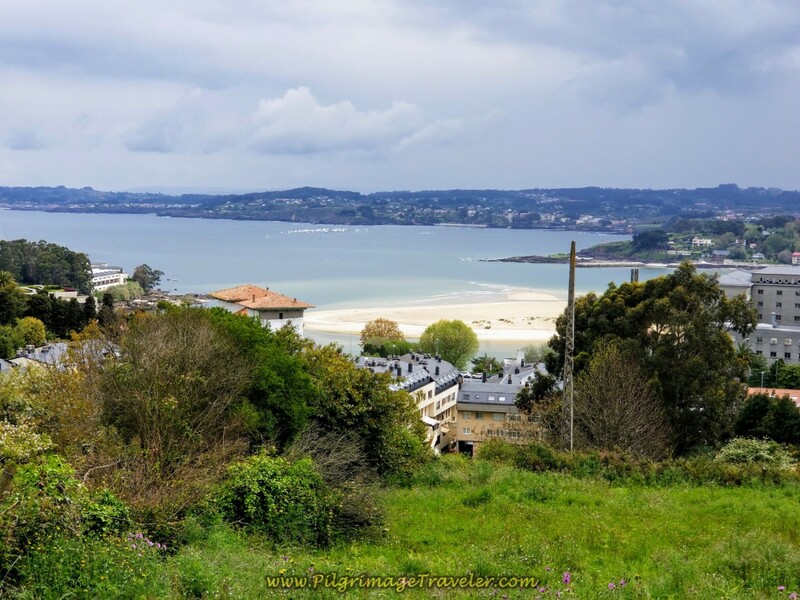 To see photos of how fabulous is this Praza de María Pita, be sure to read my La Coruña article. Take note of the height of the waymark in this photo. This is how they will appear throughout the city. 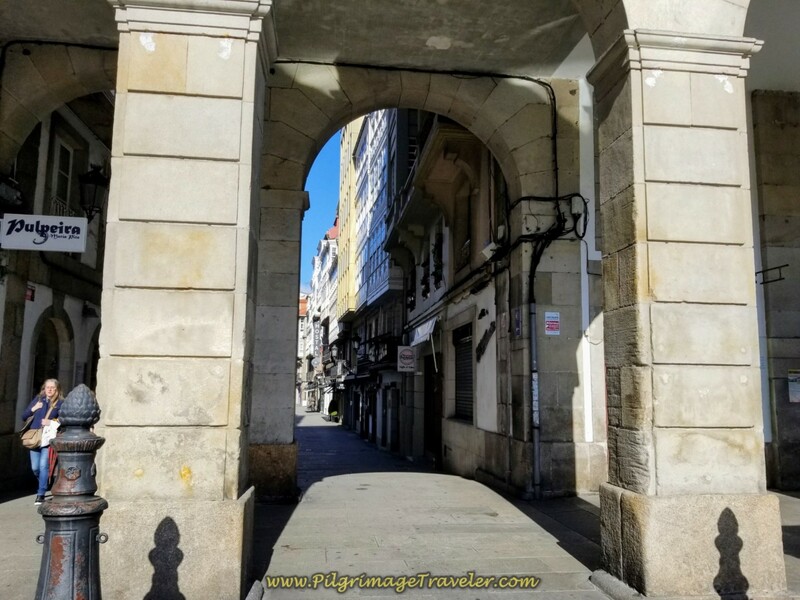 Walk across the large and open plaza and go through the double archway on the other side, shown below, and onto the Rúa Riego de Agua. After not quite 200 meters, bear left onto the Rúa Real, the main shopping street in town. 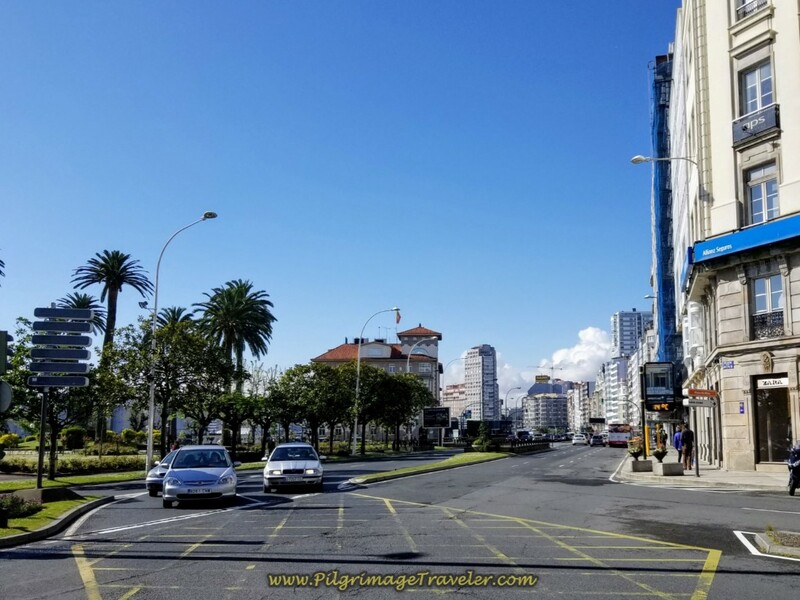 In 300 more meters, come out onto the three-lane grand boulevard the Rúa Cantón Grande at the obelisk, shown below. Continuing on the boulevard, walking through the plaza and staying to the right side of the road, head towards the landmark Abanca building with a winged statue on the summit of the tower, shown below. Pass a park on the other side of the boulevard to the left. Stay left on the boulevard at the Abanca building, shown in the intersection below. The blue directional signs are easy to follow through this section. The street now becomes the Rúa Sánchez Bregua after the bank. After not quite a full kilometer from the obelisk, you leave the street, the N-550, to walk parallel to it on a walking plaza, following the ramp up. 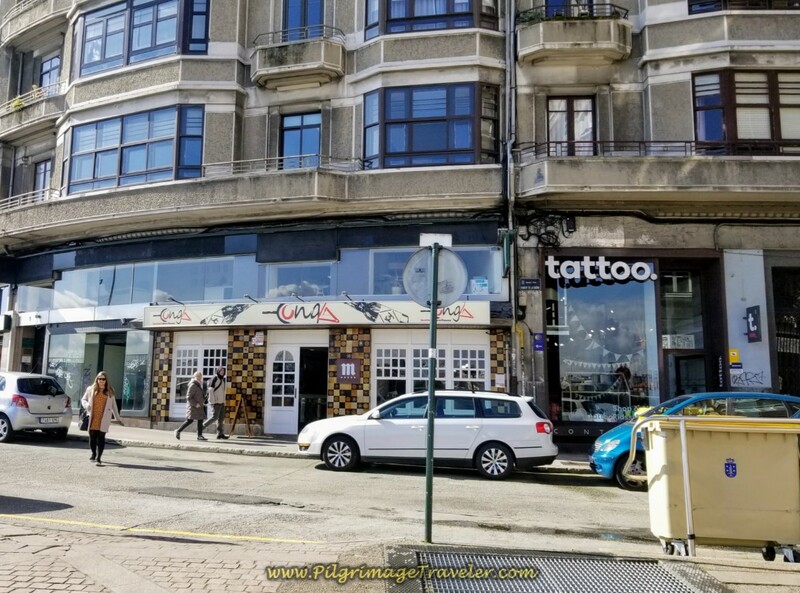 Come to a tattoo parlor in about 150 meters, shown below, and turn left, following the Camino blue sign. In a few meters after turning left, come to the N-550 at top of ramp and cross over it. After joining the N-550, in 75 meters or so, take first intersection left and onto the Av. Fernández Latorre. At first, we had difficulty finding this turn (not shown). I asked a local woman, and she tried hard to help me, but couldn't answer. I checked my map, and it only made sense that this was the turn so we took it, and it happened to be right. I marked this intersection on my Google map above, with a yellow caution sign, so you will be sure you pay attention when you get here. If you see the waymark for this intersection, take a photo and let us know! We couldn't find it. 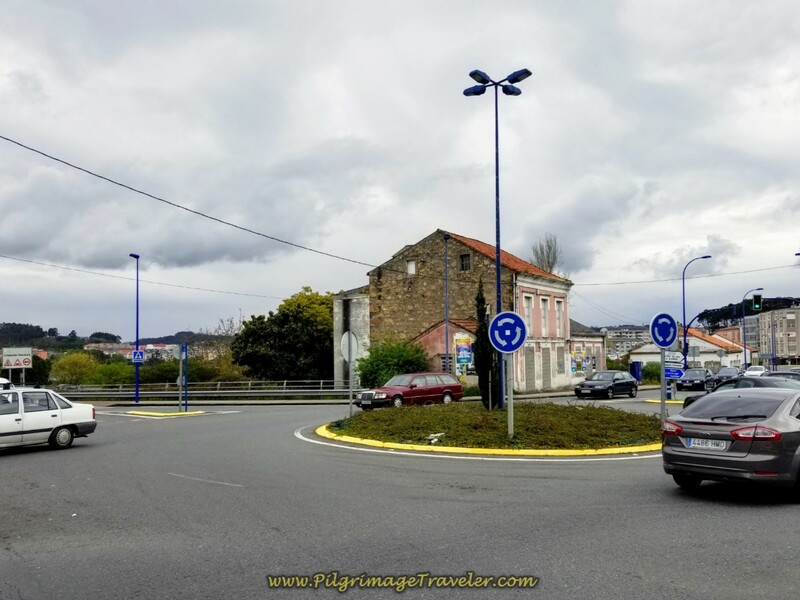 We found another blue Camino sign in about another, very long 350 meters walking, where we came to an intersection at a roundabout with a fountain, shown below. We were to go straight on. This is the landmark, Fuente de Cuatro Caminos. Walk another 400 meters, toward the triangular building shown below, with the big and bold "Seoane" name on it. Turn left at this building and pick up the Rúa Santiago Rey Fernández Latorre. Walk through the next large intersection in another 200 meters and keep straight on, picking up the Av. Alcalde Pérez Arda. 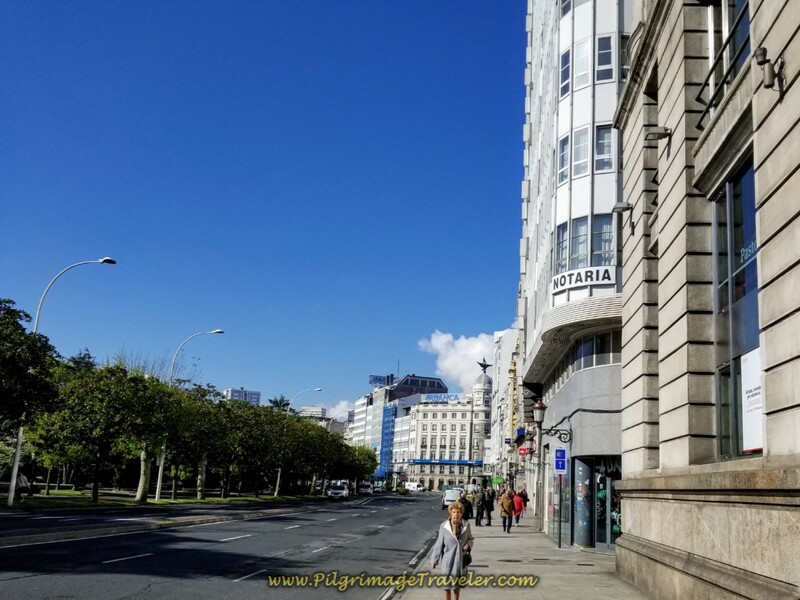 You will walk by the bus station on your right and a large department store building of El Corte Inglés on your left. This is a good place to pick up any last minutes items you need for your trip. We did! It was just after the bus station, (about 150 meters onward from the last large intersection) where we got lost. I also marked this intersection on my Google map above, with a yellow caution sign, for your information, so you will not get lost like we did. You can see the break in our GPS tracks here if you zoom in to our Google map. (After wandering about the side streets of the city, I finally turned off my GPS so I could restart it when I finally found my way). We were walking on the west (right) side of the street, just after the bus station, coming to the next small intersection. We were directed by a Camino sign to cross the street to the left at the cross walk of this intersection. On the other side of the street we did not see a direction arrow, so we continued on the small side street we thought we were to turn onto. We even asked several locals, and they directed us in totally inaccurate ways! 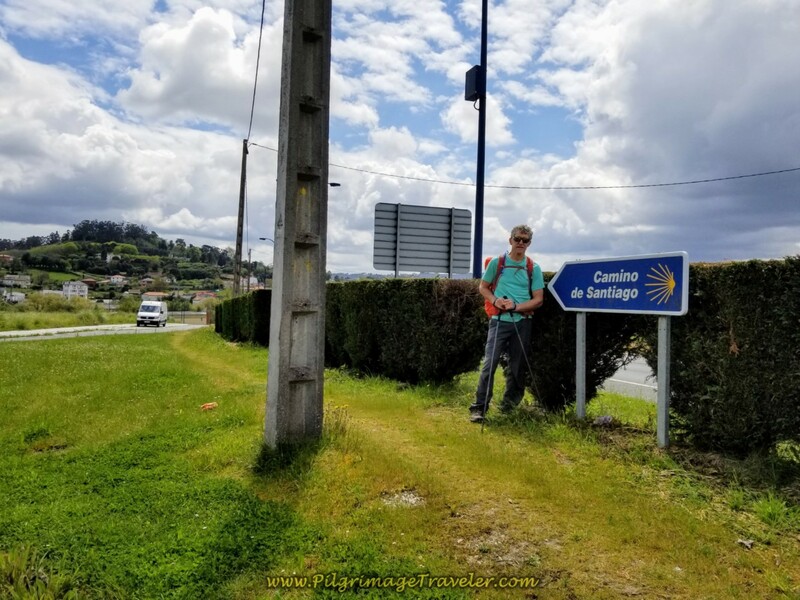 We never saw a Camino sign, so we returned to the last one we had seen after the bus station. We decided to take a stab in the dark, by remaining on the main road by the bus station, continuing southward. This was the correct decision, finally! What we needed to do, which was unclear by the signage was to stay on the Av. Alcalde Pérez Arda, merely crossing over and continuing straight on, southward. The next photo shows the next intersection we came to, as we were on the left side of the street, facing traffic now. 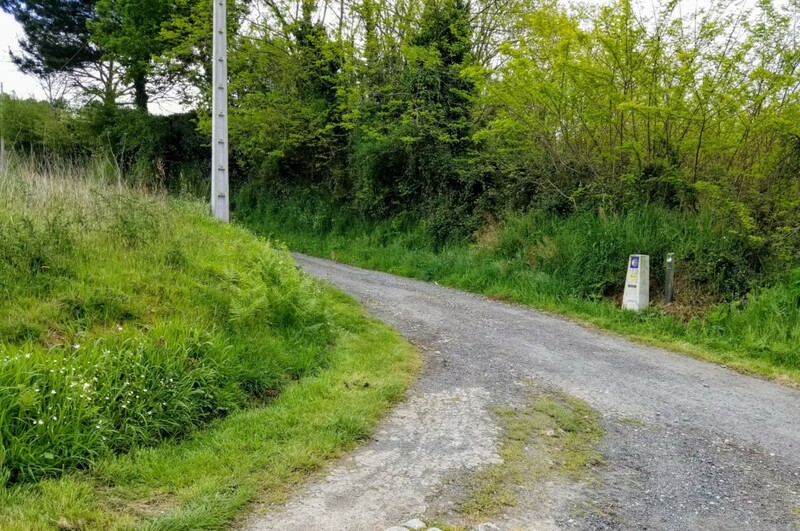 We finally saw the next confirming, blue Camino direction sign, after a very long 150 meters, telling us to stay straight on through here as well. You will know you are on the right track when you come to this metal sculpture at the next roundabout, below. You stay left at this roundabout and walk onto the Av. de Monelos. 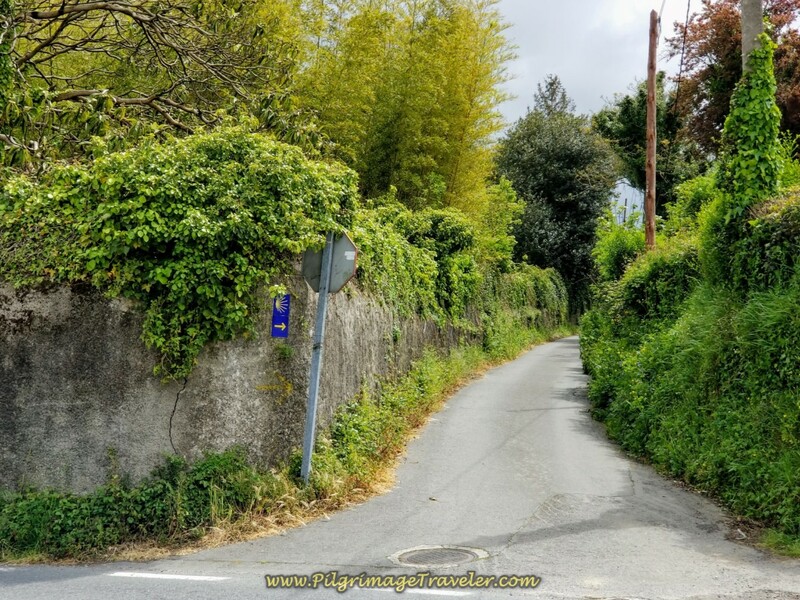 Checking in with the Facebook group for the Camino Inglés, I have learned that the municipality of Galicia has just placed additional signage throughout the city, to ease the walk through it. Click on this article for more information. It is possible that you will not get lost like we did! 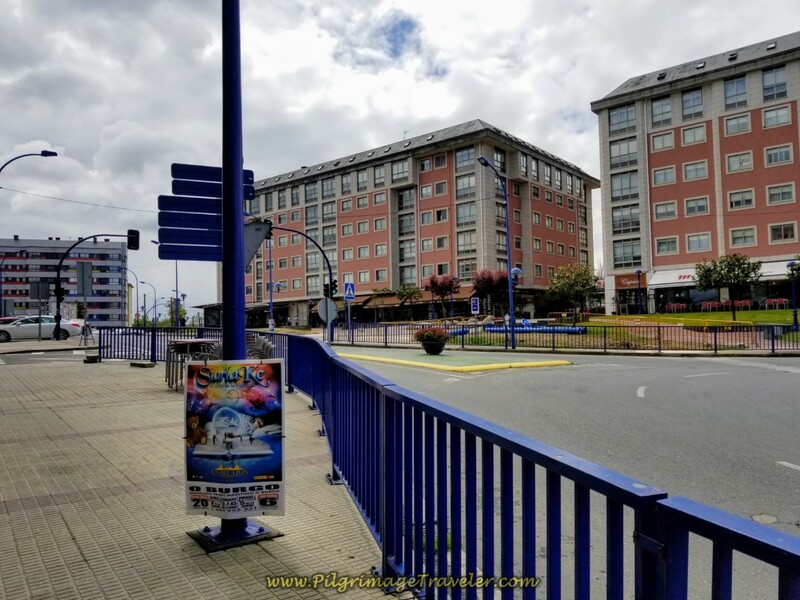 Walk on the Monelos avenue for 3/4 kilometer, until the next large roundabout, below, where you are directed to walk to the left, continuing to stay on the Avenida de Monelos. After the roundabout we passed by the first concrete kilometer marker since the beginning, in the photo below, showing 68.9. It was hard to believe that we had only come 4.0 kilometers since the start at the church, after all that wandering around! After the roundabout we started climbing a long hill, that lasted about 1.5 kilometers. This was a hump! Near the top of the hill we walked by this café, below, the Café Bar las Cadenas and decided it was time for a coffee break and some food. They served delicious tortilla here with chorizo! It was the perfect fuel for the next leg of the day. Shortly after the café we stumbled onto the first and only yellow arrow on the pavement. Once in awhile, along this section we stumbled on several other painted yellow arrows. I had a strong suspicion, that the locals had tired of pilgrims asking for directions in this area, so they painted their own arrows! While I can't validate this, we saw so few yellow painted arrows that this conclusion seemed to make sense! You keep on climbing the hill on the highway until you crest at about the Repsol station and the views of the sea below open up. This is your reward for the long uphill climb! 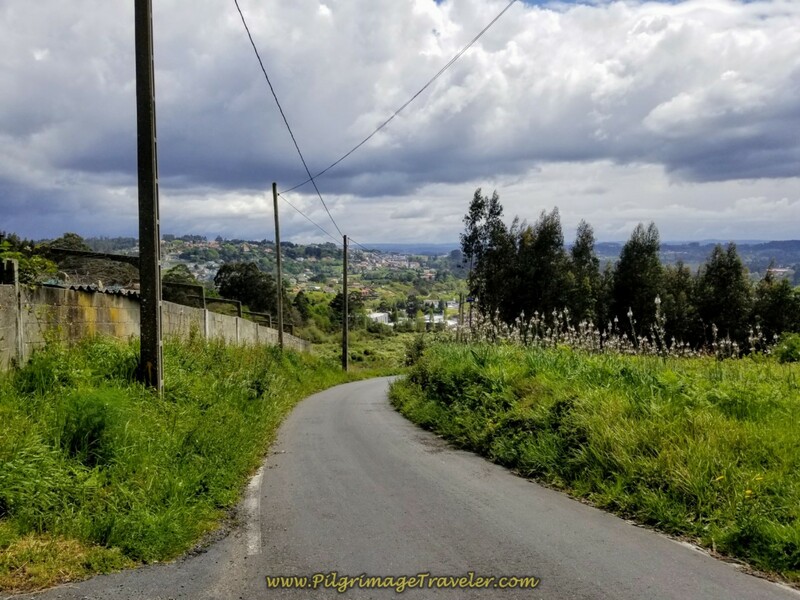 Walking along theses lofty heights, follow the road now called the Carretera Estrada Eirís and head down the long hill on the other side. Pass a modern bright gold church and head straight on to this crosswalk, below, with a concrete waymark on the other side. 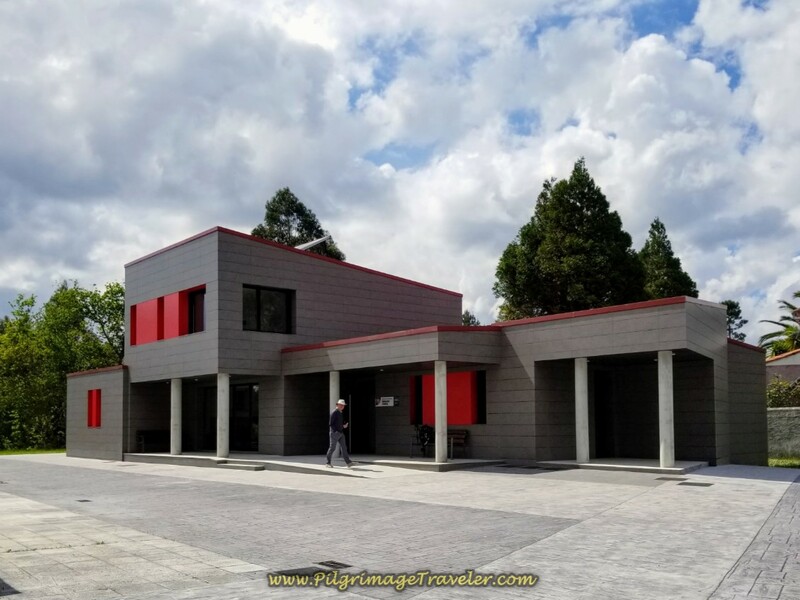 You will notice the sign by Rich that says, "Desvio Provisional por Obras." This is the second one like this that we passed. Somehow this route is a "Provisional Detour" and I don't know if the route will change in the future. You continue to stay straight on down the hill where the road becomes the N-550. Walk through a busy and nasty intersection, having to stay on the shoulder without a path or sidewalk to stay safe, see below. 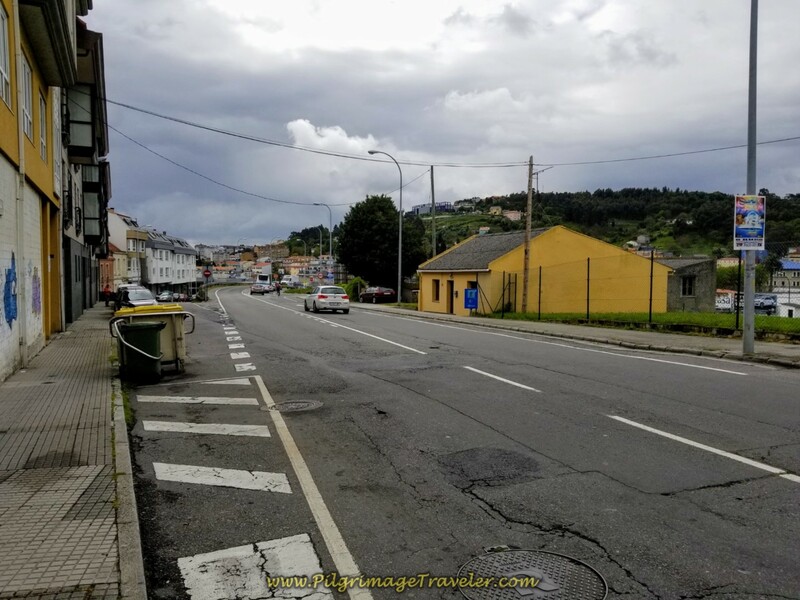 Walk over the A-11 and past the large Alcampo hypermarket on your right. (on right side of photo by gas station). 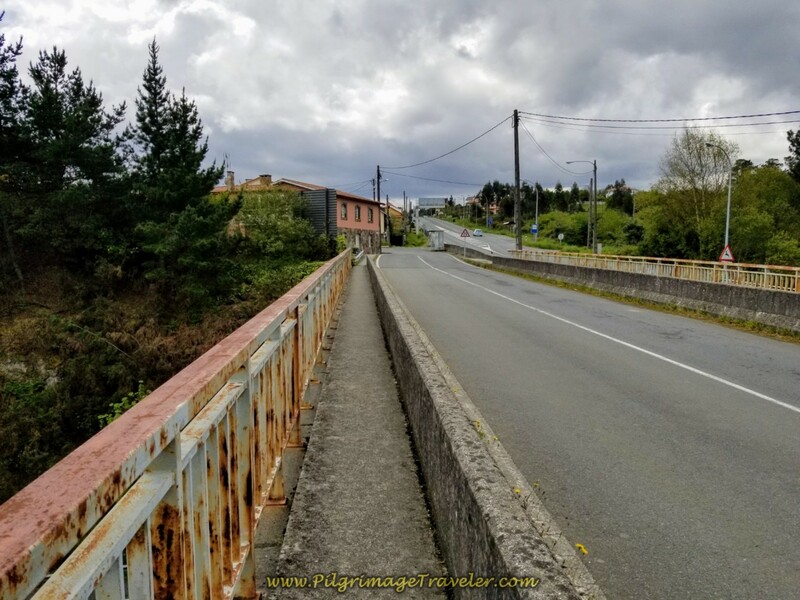 I can only hope that the Camino planners are going to reroute this terrible highway section in the future! Walk up a another long hill on the other side. After walking a total of 3.4 kilometers, following the same straight highway, leave the hill climb (yeah!) 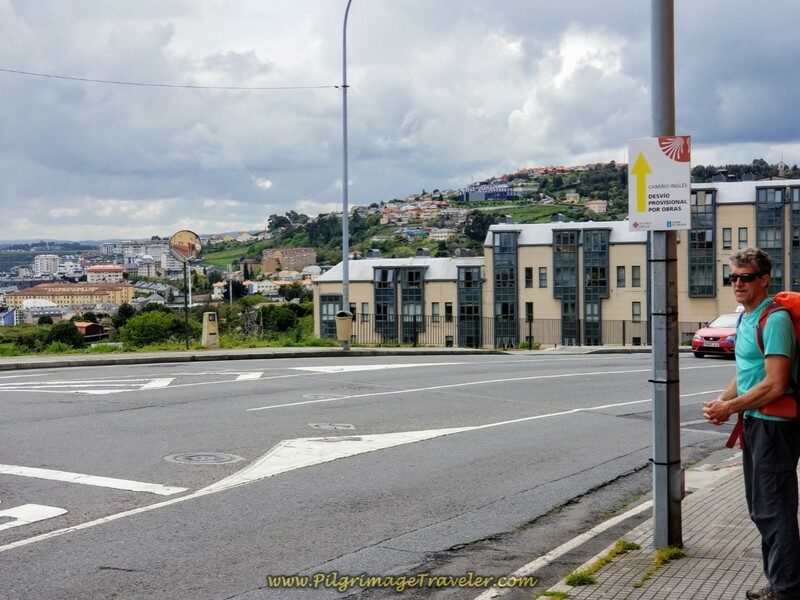 and turn left onto this street, the Rúa Alcalde Electo Carballo, crossing the busy N-550 highway very carefully first. There is no crosswalk here, and you have to make a mad dash to get across it. 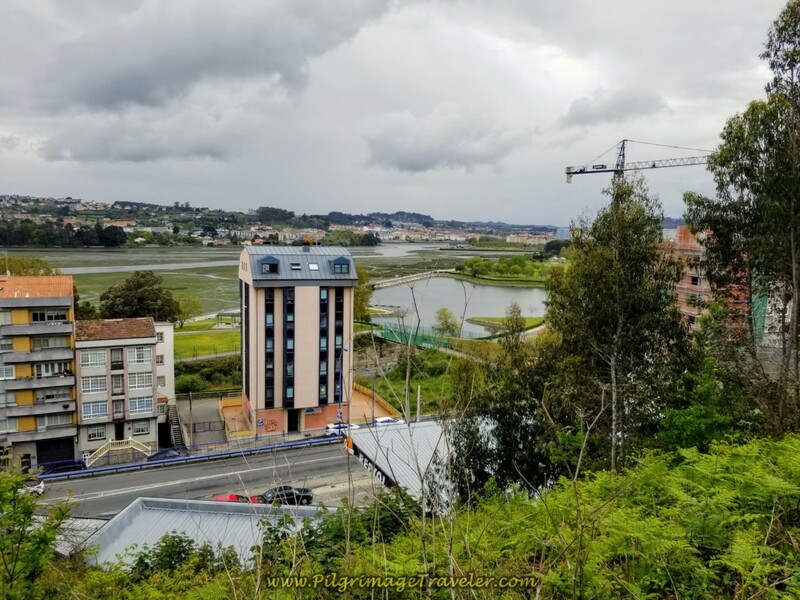 Walk down the hill once again toward the waterfront with sweeping views of the Ria da Coruña and its estuary, below. 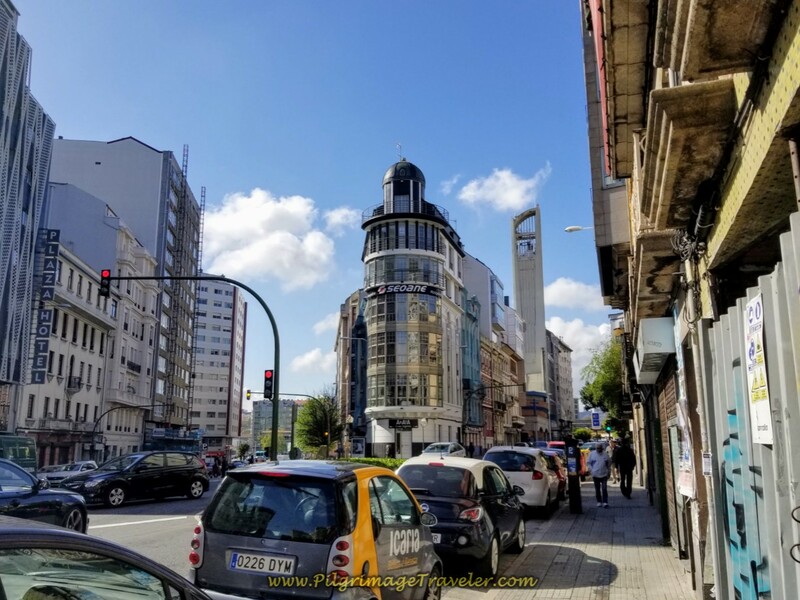 From this point onward, when you are finally out of the city of La Coruña, the Camino Inglés on day one gets soooo much nicer! Continue to drop in elevation, walking 0.80 kilometers more, until this roundabout and turn left toward the river. Walk about 60 meters to another roundabout and you will see a blue stairway down to the park below. 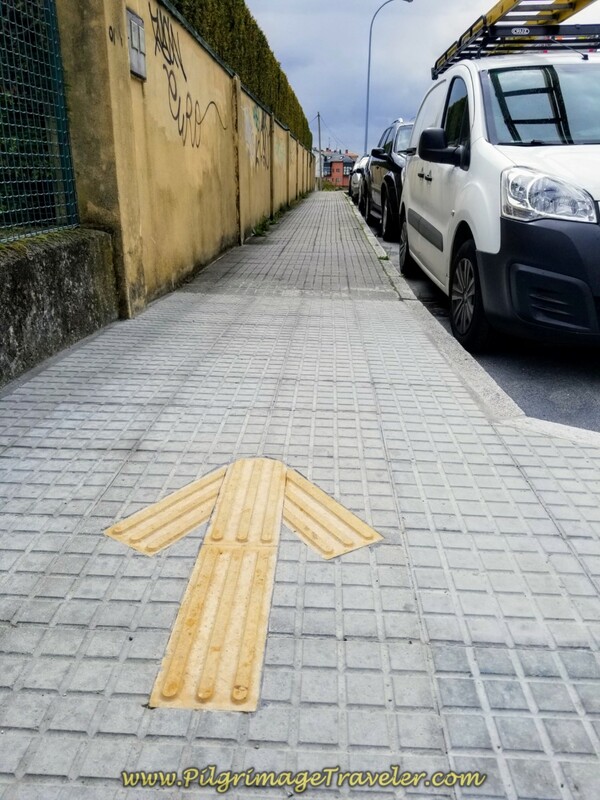 You can take this or stay high on the road, turning right to continue walking in a southeasterly direction following the signs. 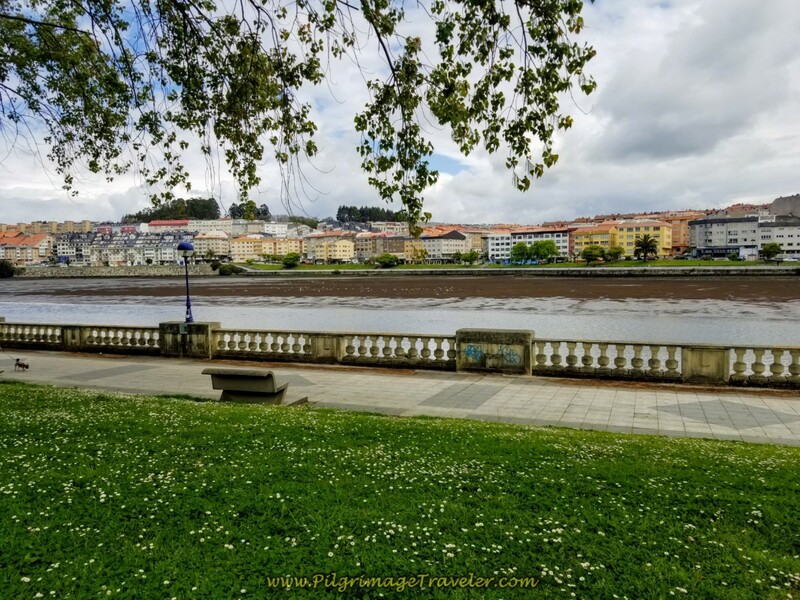 There is a beautiful pathway below, the Paseo da Ria do Burgo, that you will join, whether or not you have taken the high road or the low stairs. 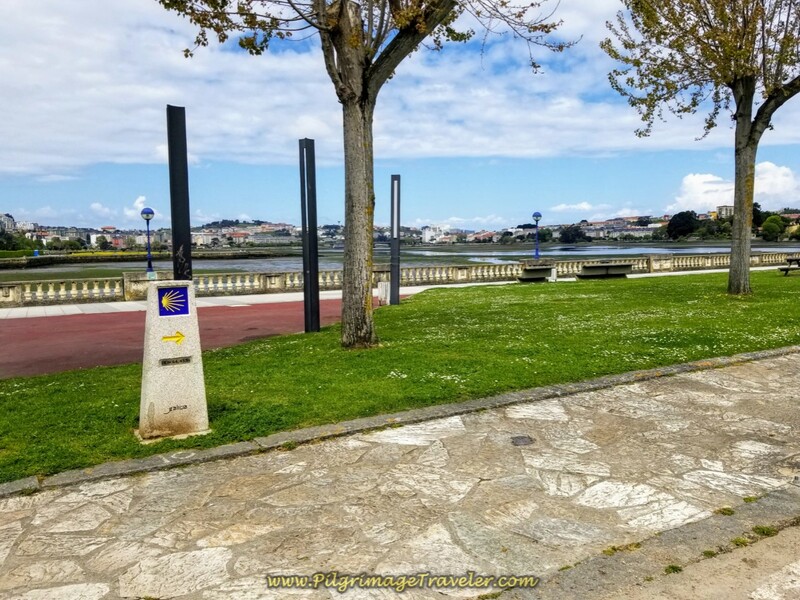 The next photos are of this beautiful paseo along the river, for a not quite 2.0 kilometers. There are toilets, benches, gazebos, all types of places to relieve yourself in more ways than one! We took a break, about 1/2 into the day, at 11 km or so. Leave the Paseo where it joins the AC-211 and turn right onto it. 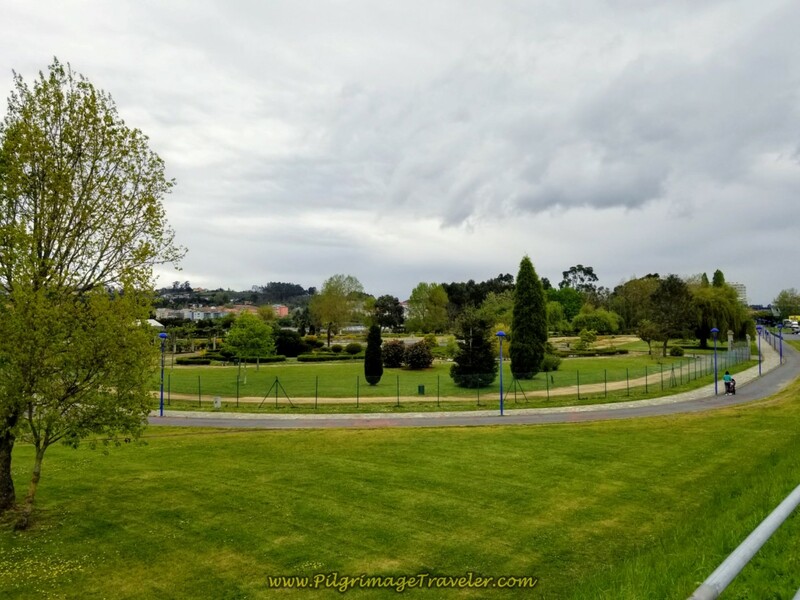 Walk straight on through the first roundabout and climb up the hill to the Igrexa de Santiago do Burgo that you can see ahead on the right. 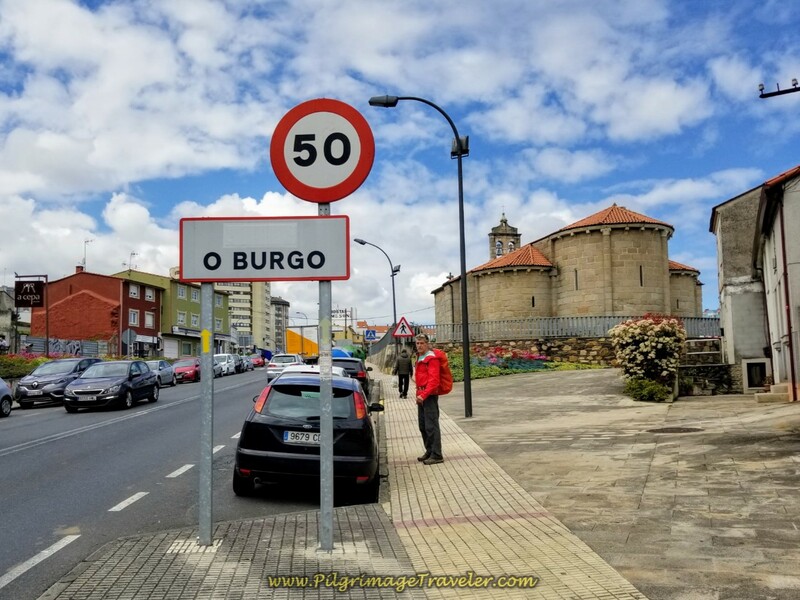 Enter the town of O Burgo. The church was not open when we arrived, unfortunately. It is of the 12th century Romanesque style, however it underwent major changes in the 18th century leaving only a few features from the 12th. 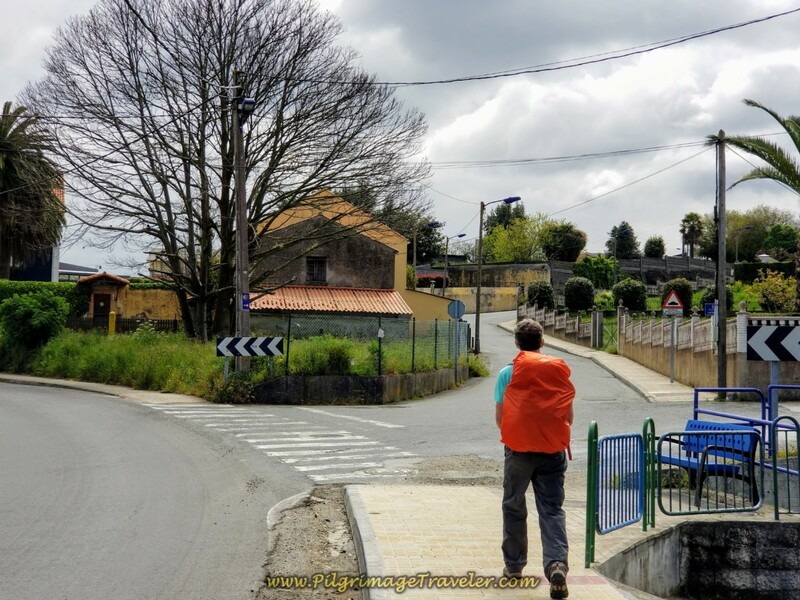 At the next intersection, the Camino takes a bend to the left and takes you up the hill through O Burgo. 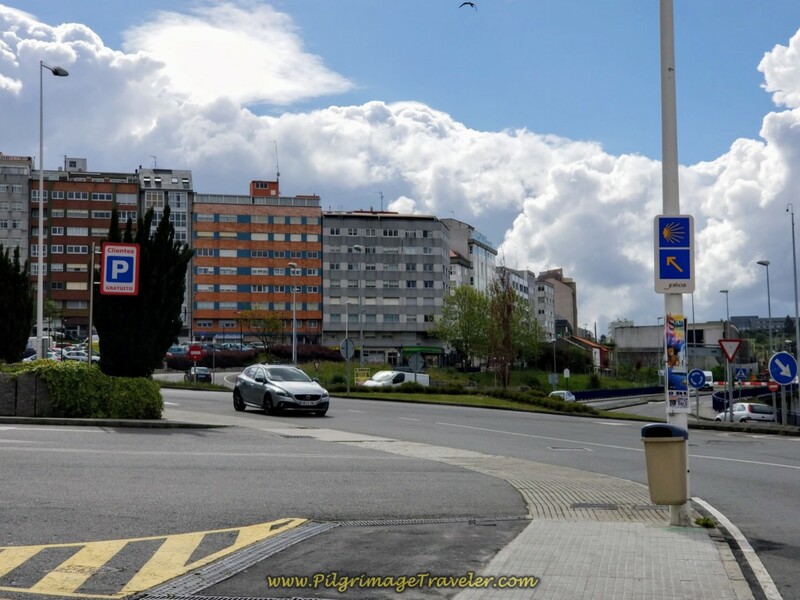 At the first roundabout after about 400 meters, turn left onto the Avenida Galicia, below. In 250 meters cross under the AP-9 overpass. Continue on for about 150 meters, bearing to the right here. This is the Rúa Pelamios. 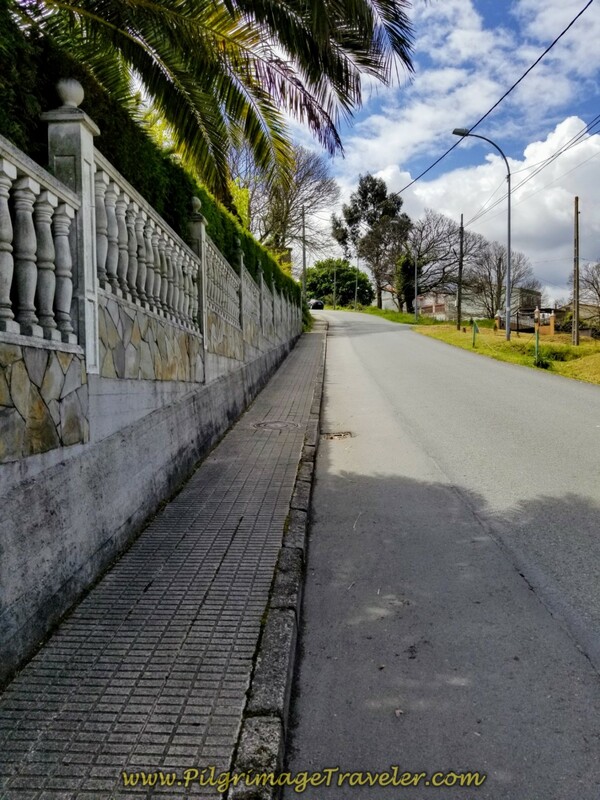 Continue climbing steeply on the pavement with sidewalks, until the first Y-intersection 150 meters later and bear right. Climb farther on the pavement with a dedicated pilgrim's path. 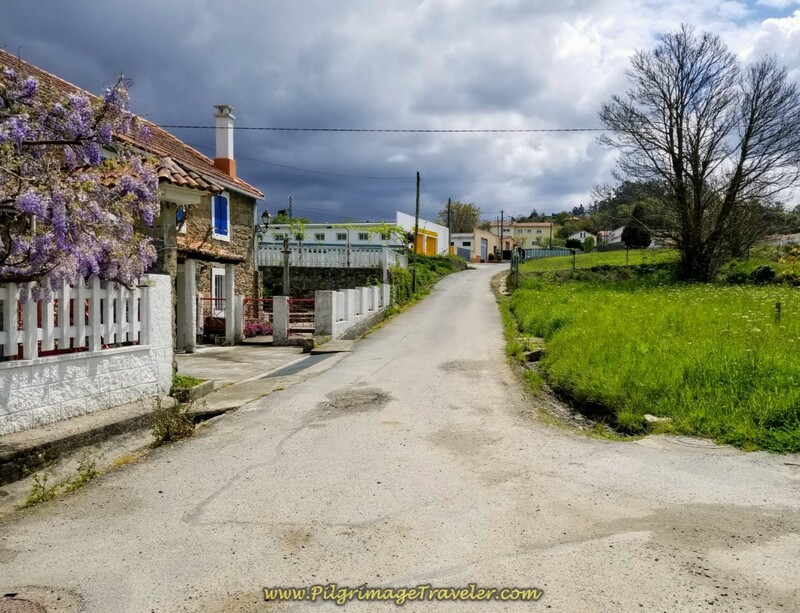 You are entering the town of Almeiras. After another 150 meters, at the top of the photo shown above right, turn right at the intersection. 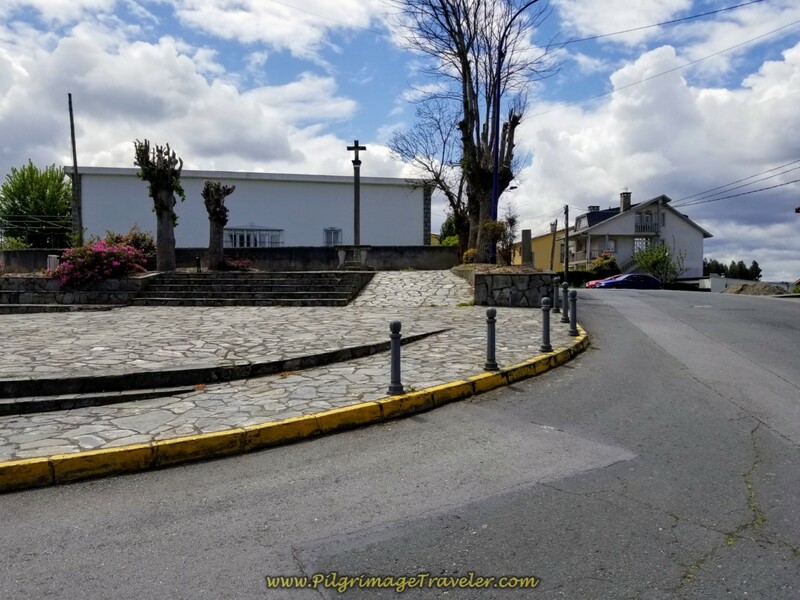 Walk onward, up the hill until you come to two churches side by side in another couple hundred meters, one with a cemetery, and the first information board on your right. These information boards that you will see are somewhat old and have lots of graffiti on them. They are the same ones I saw years ago when I did the Ferrol Arm of the Camino Inglés. But the information is still useful. Here is a photo of the Parroquia de San Xiao de Almeiras, the church farthest up the hill. 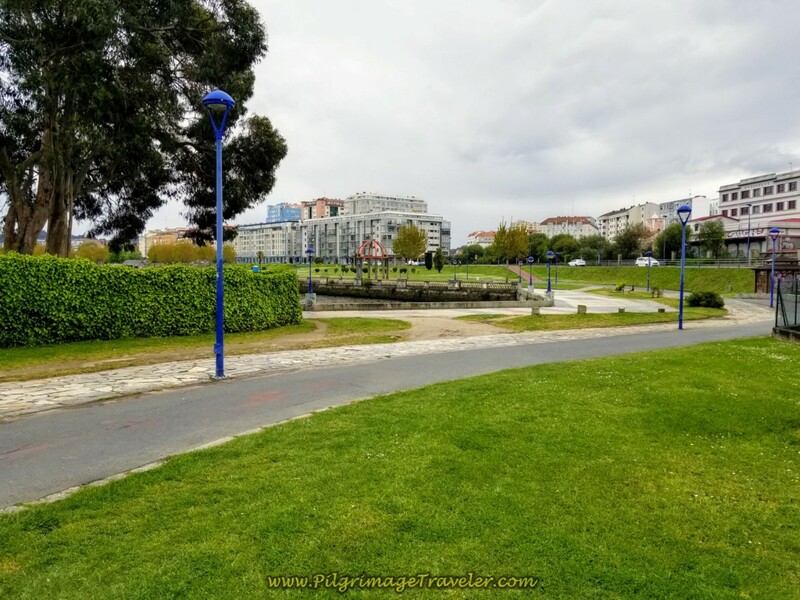 Walk another 3/4 mile along the Rúa Catas in the direction of a small town called Alvedro. There is a nice downhill reprieve for the next kilometer or so. Come to an intersection, shortly after a big soccer field on you left. Turn left at this intersection, away from Alvedro and continue on down the hill, shown below. Walk another 400 meters to this T intersection, below on a nice downhill. Turn right at the T-intersection in an industrial-looking area. Walk through a large roundabout and join the N-550 on a side path to the left. In about 1/2 mile, come to the Pensión La Paz, shown below. 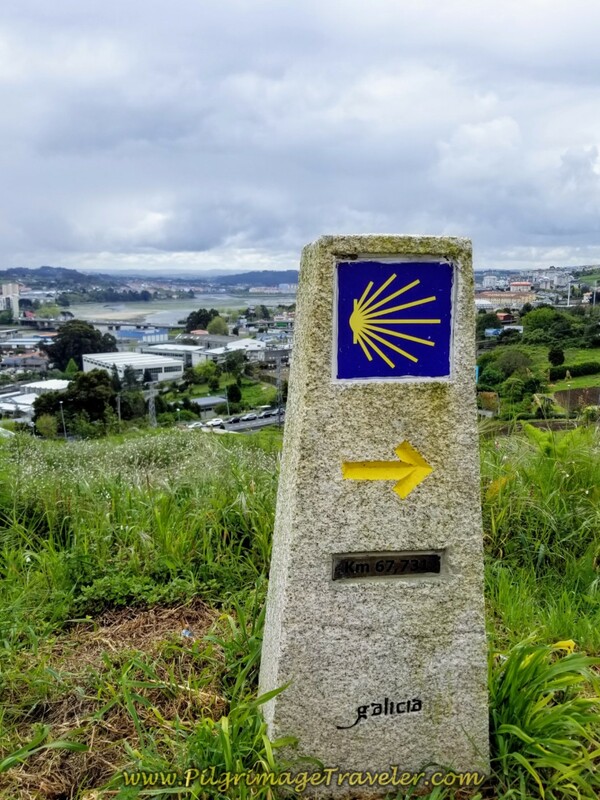 You are now about 12 kilometers into day one on the Coruña Arm of the Camino Inglés. There are two restaurants at the Pensión, one a grill that everyone was rushing to on a Monday afternoon! 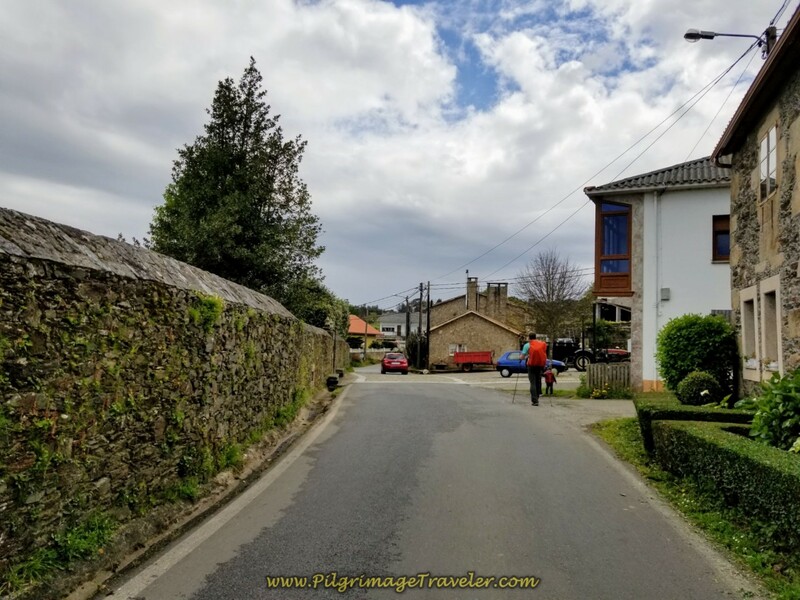 Continue down the N-550 to the side, picking up a street called none other than the Camino de Santiago. 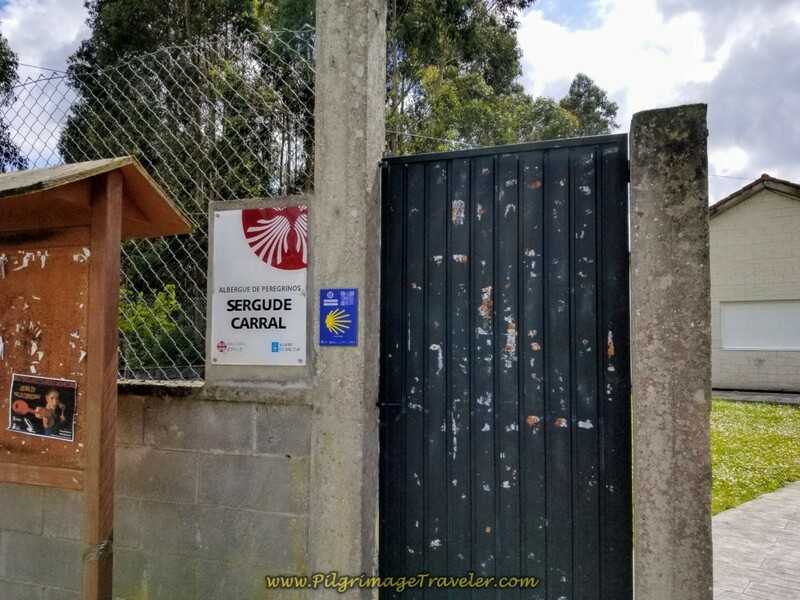 And wouldn't you know it, there was a sign for the Camino de Santiago through this section. In 1/2 kilometer from the Pensión come to a large roundabout in the town of A Pena, with a gigantic supermarket on the opposite side. This is your last chance to shop for food if you wanted to cook at the albergue in Sergude. There is only one café in Sergude, so if you do not cook, this will be your only choice. 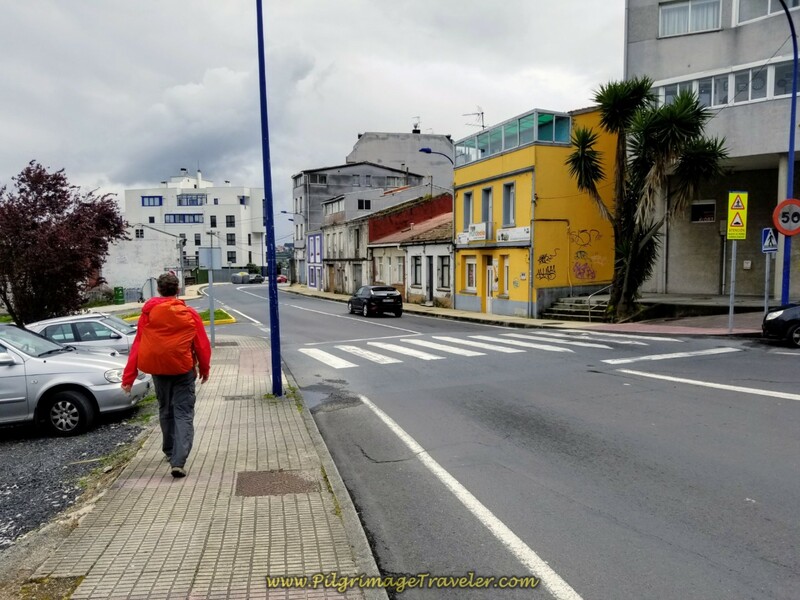 The albergue is still a good 8.0 kilometers away yet, and does not have much in the way of cooking equipment, so if you are buying your food for dinner, aside from a microwave, there is not much there. Not even a refrigerator, nor pots or pans, nor eating utensils! 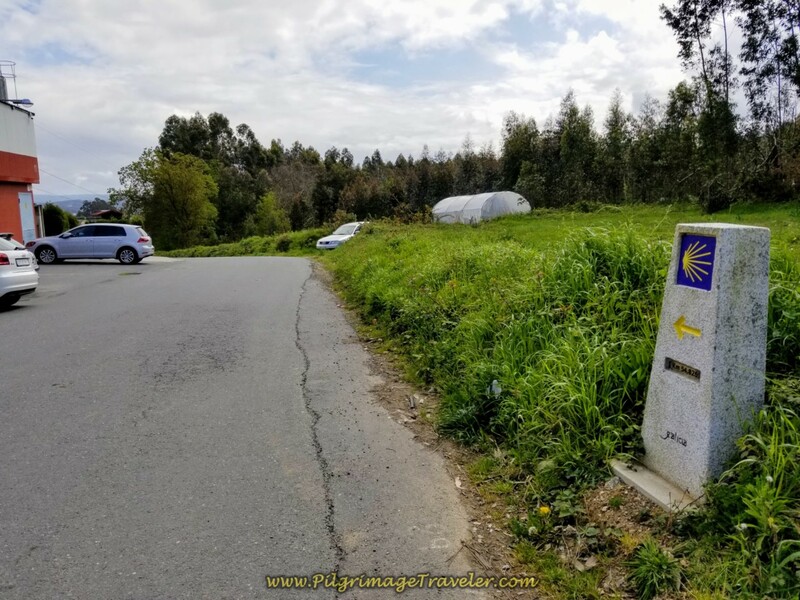 The Camino goes left at the roundabout and picks up a path for a short while until turning right onto a dirt lane, descending and crossing over a stream before climbing up and onto a narrow road towards the town of Sigrás de Abaixo. Get ready, because from the stream onward for the next 5 kilometers it is a tough uphill climb on pavement! 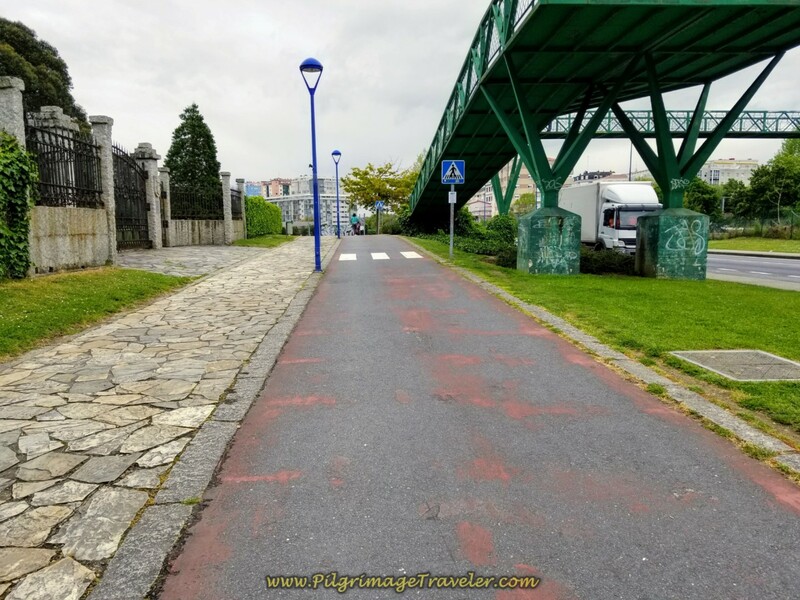 Come to an intersection in about another 1/2 kilometer and cross over keeping straight on here onto the paved lane called Sigrás Dabaixo. In another 1/2 kilometer we came to this cruceiro, where Rich got down on his knees and prayed for flat road! Ha ha! It was an arduous climb from the Pensión to here. 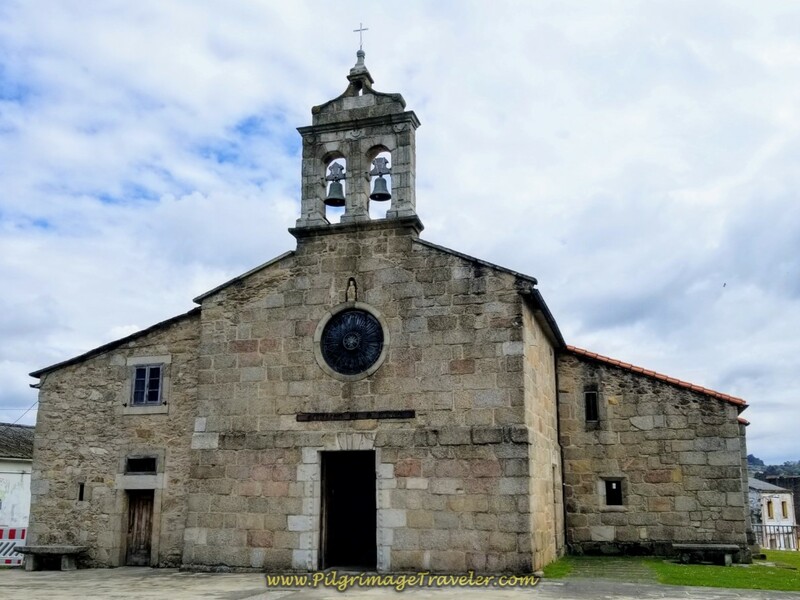 In a few hundred meters you come to the church, shown below, the Igrexa de Santiago de Sigrás. 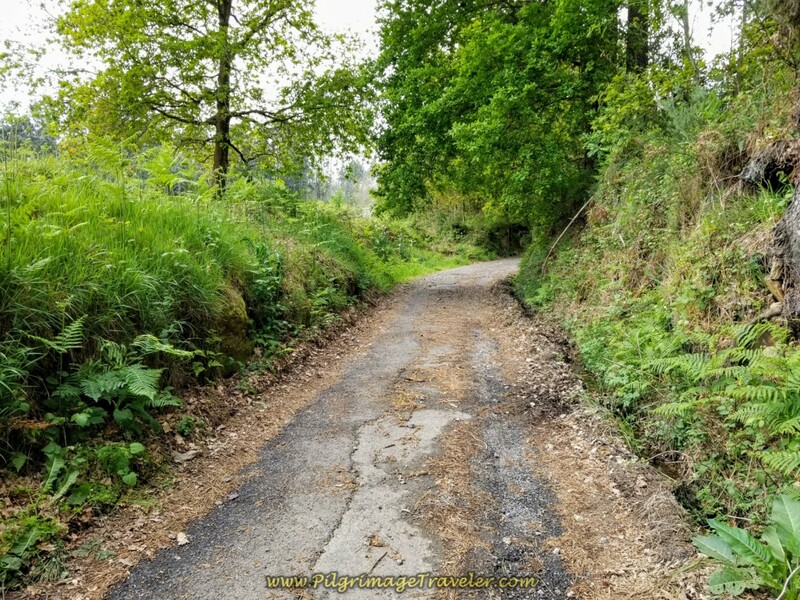 The Camino actually levels out here for a bit! We sat down for a few minutes rest under the big tree! In a few hundred meters after the church, turn right here onto the street called the Sobrecarreira. 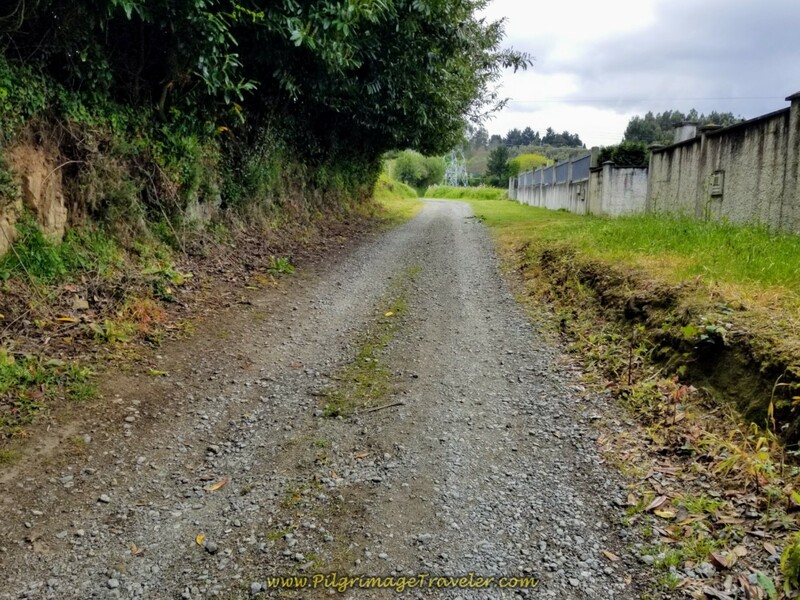 Continue on the steady, less steep climb on this very rural country road. Between the rural houses and walls, you can see the expansive views of the countryside. It is a lovely, albeit strenuous walk. You will feel very high up, walking through this area. In another 1.0 long kilometer uphill, come to the intersection with the DP-1702, cross over this intersection and turn right here, shown in the photo below, toward the direction of Anceis. The kilometer marker reads 57.7. Getting closer to Sergude! You are now on the busier CP-1701. A few meters onward, cross the A-6 on this bridge. 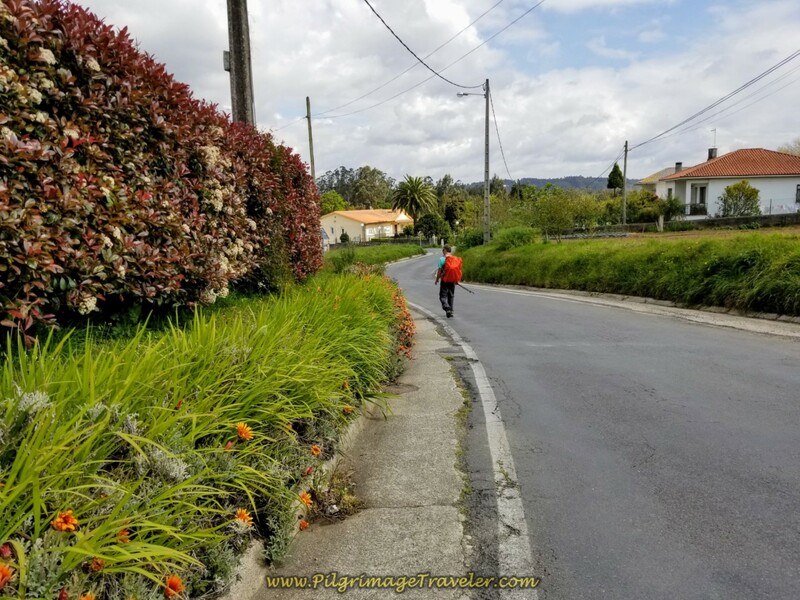 Continue the steady climb on the CP-1701 on sidewalks, then continue on the Rúa Drozo, a narrow and rural road once again. 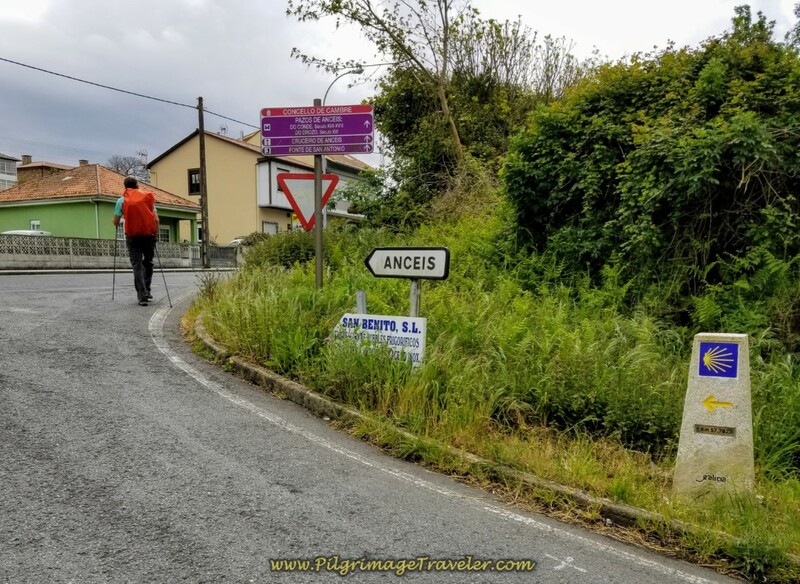 In not quite one kilometer enter the town of Anceis. There is a nice information board here and a fountain, the Fonte de San Antonio. There are trees and benches here to rest if needed. After the fountain, bend to the left on the Rúa Anceis as it walks you through the town. 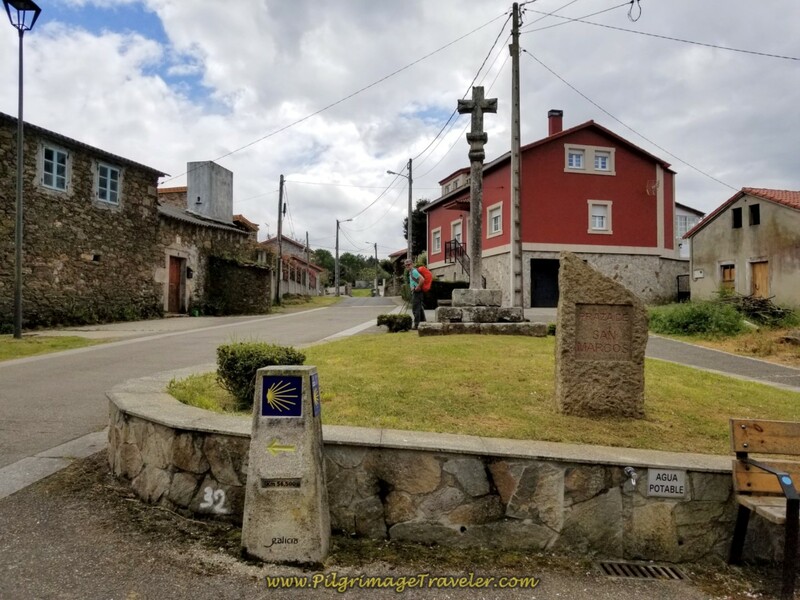 The street bends to the right and comes to this cruceiro, below, at the other end of town. The kilometer marker says 56.5, and there is a potable water spigot and a bench here as well. This is the Praza de San Marcos, as the sign indicates. Follow the waymarks out of town, and turn right onto this gravel road. Continue the steady climb. Come to a T-intersection, here and turn left onto a semi-paved lane. Another 600 meters down since the last kilometer marker! Here is Rich on the lane, continuing to climb! 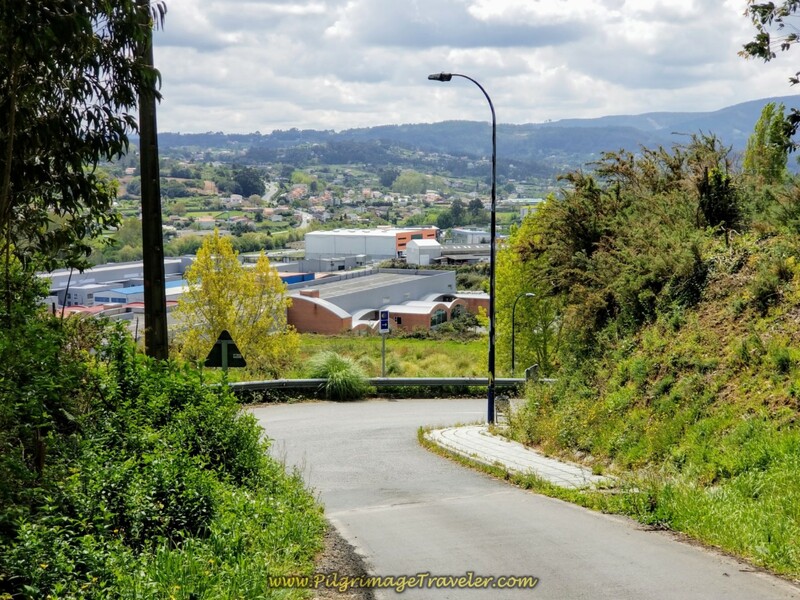 Don't Stop Climbing on Day One of the La Coruña Arm of the Camino Inglés! A short stint through the woods on the lane, makes for some shade, at least. Follow the Way to the left on another dirt lane. You come to the end of the lane, about one full kilometer later at this Camino Inglés information sign and "Welcome to Carral." Come out at this 54.8 Kilometer marker, and onto the paved road. There is a restaurant and bakery here on the left, but since we were now only 2.0 kilometers from Sergude, we did not stop. But it is an option! You are home free as the climbing is also now over!! It is a nice downhill amble from here into Sergude. The downhill walk through Carral is pictured below. Where's the town? In 1/2 kilometer, turn right onto the DP-1708, then in 150 meters, a left onto the CP-2103. More wonderful downhill. 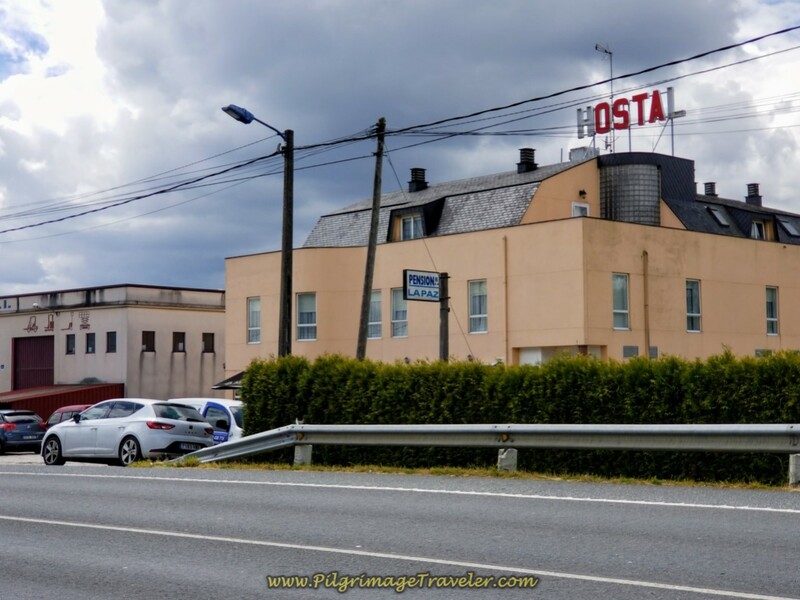 In only one kilometer on the CP-2103, you come to the sign for the albergue! And inside the gate, is the Albergue de Sergude. 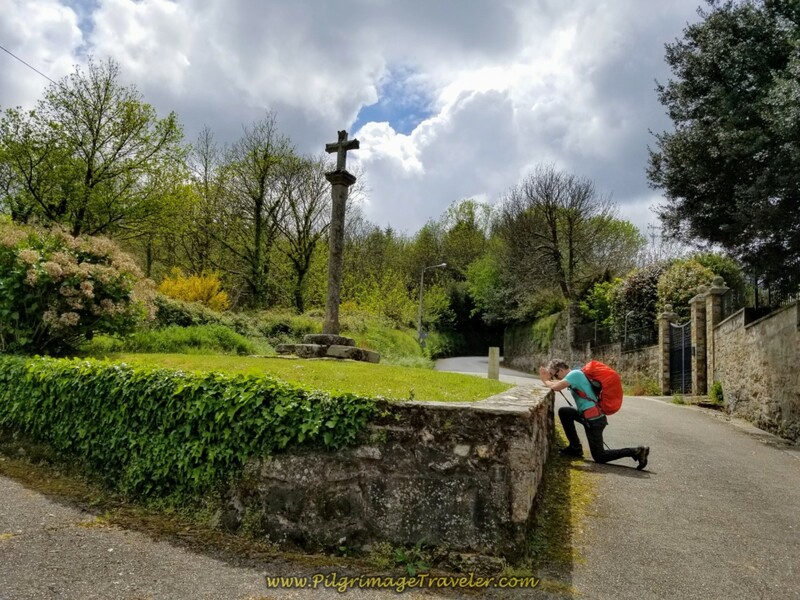 We shared the albergue with exactly three other pilgrims that night, at the end of April, 2018, for a total of five of us. The albergue was brand new, but the kitchen had nothing to cook with, as I stated above. It had a washer and dryer which we used, for an extra charge, and two large open dormitory rooms, with about 14 beds each. There were no blankets available, but we were allowed to turn up the heat, which I did! I slept as close to the heater as possible, because it was a very cool night and all I had was a sleep liner. In lieu of cooking, we went to the Casa Adolfo, just down the street about 400 meters. One by one the others from the albergue joined us there and we were all offered a pilgrim's meal, served to us in family style. The proprietress herself was the cook in this rural bar and she brought us mountains of salad, french fries and pork loin. The food was fantastic and served with a loving, warm and motherly heart. I believe we paid eight Euros each for the meal! This day was very arduous for me, and I was feeling like I was getting a sore throat at the end of the day, along with some stomach upset. I was hoping it was just due to dehydration, so I drank a bunch of water and laid off the alcohol. I did feel better after the fabulous meal at the bar. 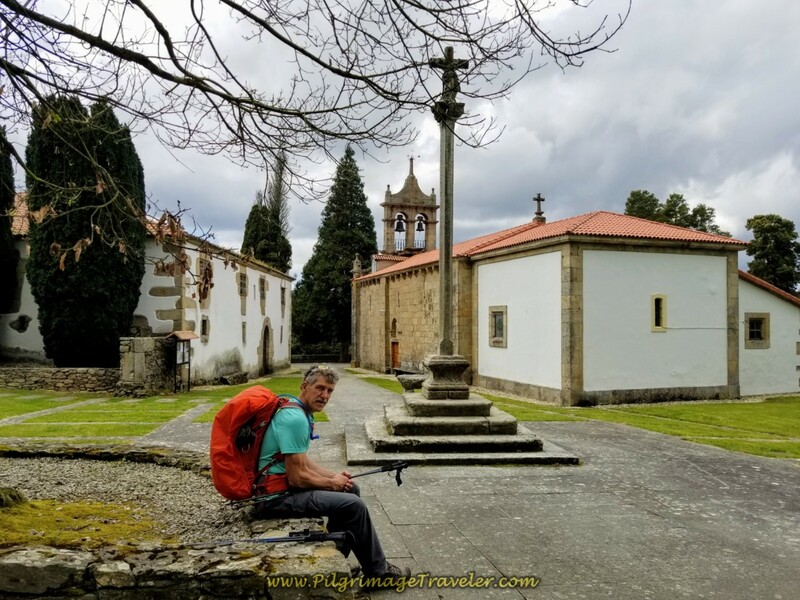 I was missing the friends we had made on the Camino Portugués, having just come from six days on the Central Route. 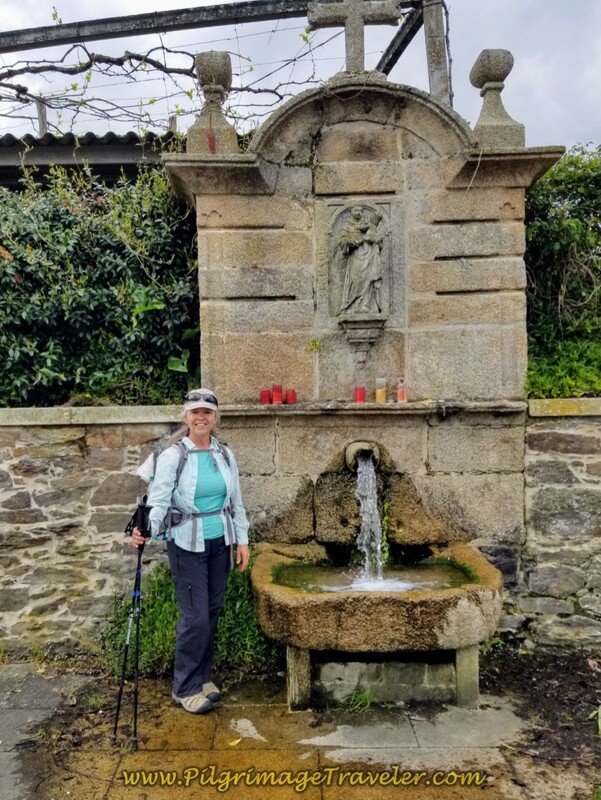 We had bonded with a group I fondly called "Team Magdalena," assisting a young woman in a wheelchair to complete her Camino. Click on the link to read this amazing story! 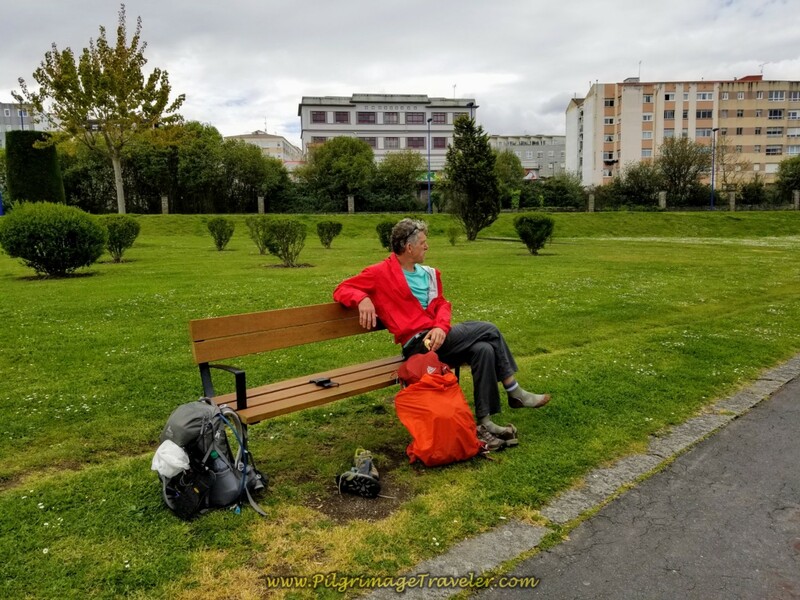 Not only was day one on the Camino Inglés, La Coruña Arm a physical challenge, it was an emotional challenge as well. I was teary for many portions of the day, missing Team Magdalena! Because of this I was reluctant to make connections with other pilgrims on this day. Our prior day on the Central Route was long, rainy and difficult. 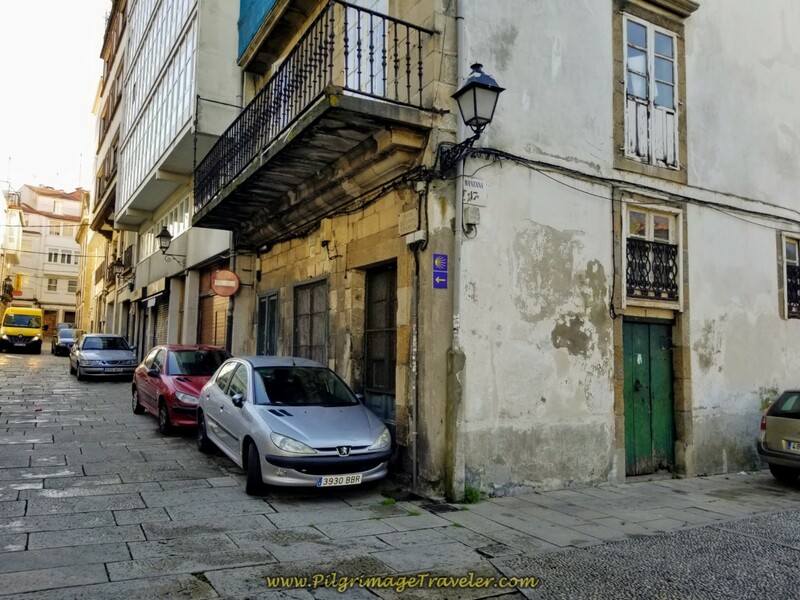 We mistakenly thought that this day would be easier, having come from the central mountains of Portugal but it was not! We had set ourselves up for our own pain, so we had no one else to blame. My only word of advice, is definitely do NOT be fooled by day one out of La Coruña! 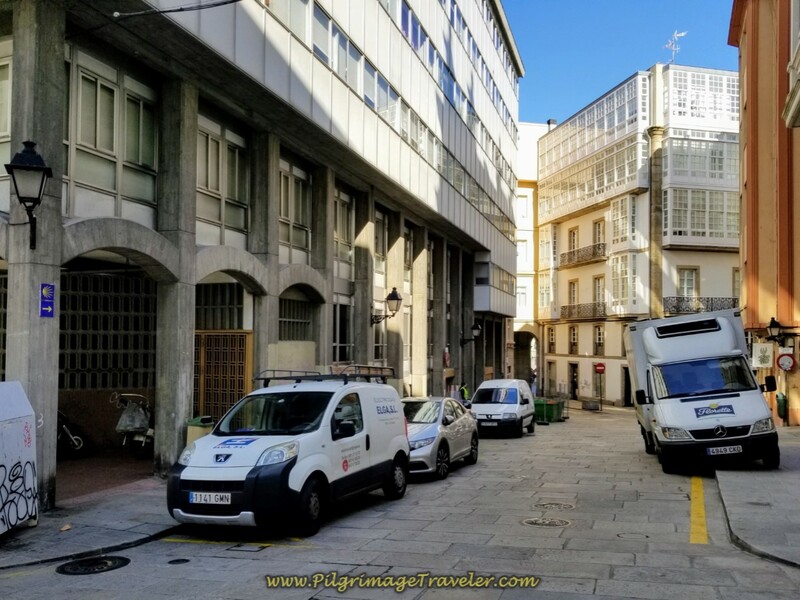 It is full of many ups and downs, all on pavement, with the walk out of La Coruña not all that lovely! I can't imagine doing the entire way to Bruma in one day. Especially if this day was your first. The 21 kilometers beat us up enough, and we consider ourselves to be quite fit. I felt like day one was indeed a pilgrimage, a journey through my life that did not feel very sacred, but just hard work. Was my soul enlarged and enriched after this day? I'm not sure, but this day built my character if nothing else. And that is indeed a spiritual thing. May your own day one on the La Coruña Arm of the Camino Inglés be a special pilgrimage day of your life. May it be through unforeseen sacred places that enlarge and enrich your soul, however that looks for you! Ultreia!